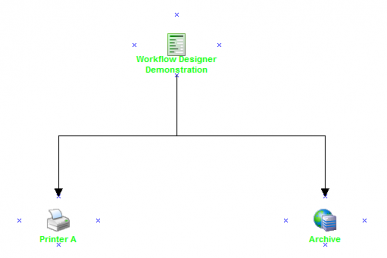 10 What is the Workflow Designer? 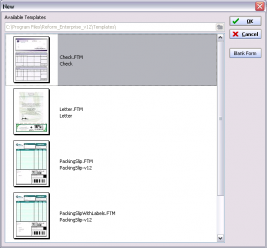 VDP Designer is a program that allows users to enhance forms generated by your application. Because of its simple "what-you-see-is-what-you-get" approach, the VDP Designer is easy to use. The objects that you add to your form on the Design layer reflect exactly what your form will look like if it were printed out. In order for Reform to generate the printout that you need, you must create a template for each of your forms. The template serves as a new layout for each of the forms generated by your application. It is similar to using a pre-printed form, where the text is overlaid on the form. 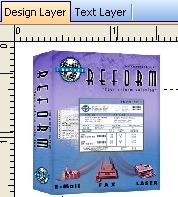 All required Reform software downloads can be found at www.fabsoft.com in the Downloads section. To install the Reform VDP Plugin, download and run the installer. 1) Open the VDP Designer application by navigating to your desktop and clicking on FabSoft Reform folder, then the VDP then on VDP Designer. The Design Layer tab is where you create your forms. The simple drag-and-drop interface allows you to add and alter data, text, graphics, shapes, bar codes, etc. The default view of the VDP Designer is a traditional view, which uses 2 tabs that represent the Design Layer and the Text Layer. Click each tab to switch back and forth between the Design Layer and the Text Layer. 3) Select Check.FTM and click the OK button. 4) You will be asked if you want to open a text/ASCII file (also known as spool file) for designing. Click Yes, now it will ask you to select a file. Go back to the root directory and browse to Reform…\Backups\ and select Check.out to load the file. The templates come with sample spool files. Outside the tutorial your spool files will come from your Application. 5) In the Designer Layer, you will notice that all our fields (Pay, To the order of, Amount, etc..) are populated. 6) The Design Layer displays both the Design Layer objects and Text Layer objects. Go to Edit>click Show Bounds to display the border of each field in the form. 7) Let’s take a closer look at these two objects, Amount and $719.51. Both objects are created using the Text object. 8) Click the object that has the word Amount. 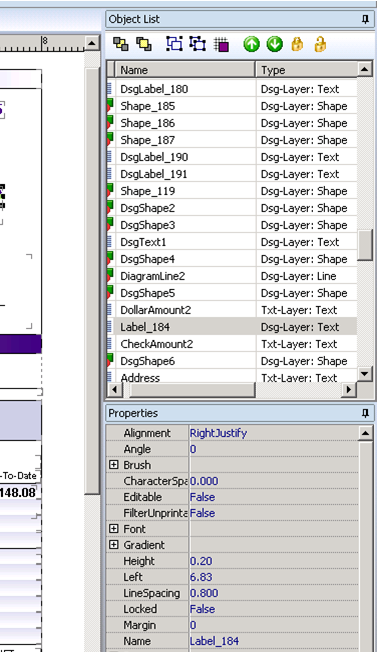 You will notice on the right side of the VDP Designer, under Object List, Label_184 is the object name and next to it is the object type Dsg-Layer:Text. Dsg-Layer-Text tells you that it’s a text object in the Design Layer. Every time you create an object the VDP Designer will assign a name to it, but you can always rename it by going to the Properties Window. 9) Let’s learn how to add a label. First, let’s delete the label Amount, Right Click on the object and Click Delete to remove the object. 10) Now, go ahead and put back the label for Amount. Go to the Available Objects Window, and Click Text. You will see a White Cross next to your cursor, click where you want to add the Text. A New Text object has been created. 11) Right Click on the Text object, Click Edit, and replace New Text with the word Amount. Let’s also resize the Text object so it’s just big enough for the word Amount. Left Click on where the red box is drawn, hold it down, and drag it closer to the word Amount. 12) So far you’ve learned how to manipulate the Text object in the Design Layer. Now let’s try doing it in the Text Layer. Click on the object that displays $719.51. While the dollar amount is selected let’s switch to the Text Layer by Clicking on the Text Layer. 13) You will see that $719.51 has Text object over it, the object name is CheckAmount2, and the object Type is Txt-Layer:Text. While the object is still highlighted click Delete on your keyboard. 14) Switch back to the Design Layer. You will notice the dollar amount $719.51 is no longer displayed. 15) Let’s put it back by mapping the Text object to the dollar amount field in our Text Layer. 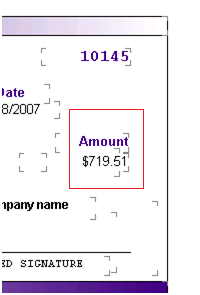 Switch back to the Text Layer, go to the Available Objects click on Text, then click on $719.51 to create the Text object. You may need to move the object so the data falls inside the text object. Click on the Text object; hold it until it’s mapped correctly. If you want to move the object you need to click inside the box, if you want to resize the object you need to click on the tiny boxes on the border. 16) You also want to keep in mind, when mapping your data, you have to assume that the information can grow and shrink, like our dollar amount. For that reason our text object is big enough to accommodate larger dollar amount. 17) Switch back to the Design Layer, and look for the object we just created. Since the text layer we added is somewhere in the middle of the canvas, it will be in the same location when you switch to the Design Layer. If the text layer you created is in the bottom left, expect it to be in the bottom left of your VDP Designer screen. After finding the Text object $719.51, move it under Amount. 18) After moving the object your form should look like the image below. 19) By selecting the object and clicking on the Text Tool box, you can change the property of the text. 20) By selecting the right color and making the text bold, the label matches the rest of the labels on the check. 21) Now go ahead and save the form by going to File>Save As. 22) Type in CHECK, and click SAVE. Congratulations! You just created your first form. 23) You can go to File>Preview… to preview the Check form. Or if you want to Print the form go to File>Page Setup… to open the Page Setup Window. Click on the Printer Icon to view the available Printers on your machine. 24) Select the printer you want to use to print the Check. Click OK. Save the form. Go to File>Print and the Check should print from the selected Printer. 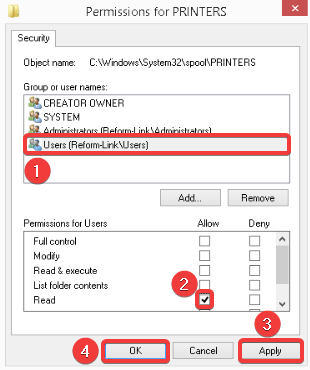 25) If you would like to see this check form automatically print, use the windows file explorer to copy the Check.out file in the Reform\backups directory to the Reform\Spooler directory. As long as the Reform Spooler is running and the new check form is in the list forms to monitor this should print to your defined printer. Because your application needs a way to send information to Reform, Reform comes with capture utilities to make this possible by seamlessly linking to all operating systems and applications. Because this is usually the most difficult step, FabSoft offers a free service to help you make this connection Free Data Capture registration. Some applications may already have a seamless link to Reform. Consult your software manufacturer for information on existing seamless links. 1. Using the included Reform Printer Driver. Users can print directly from their applications. The Reform Printer Driver can capture data from any Windows-type application. 2. Using the included LPR/LPD for connections to AS/400, UNIX, Linux, AIX and other systems. 3. 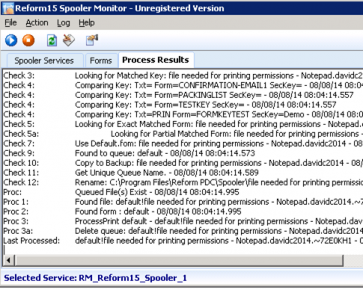 Capturing print jobs from your workstation’s LPT ports. 4. Capturing print jobs from the DOS operating system. 5. Reading from a common text file or temporary print file. 6. Capturing data from a serial or parallel port. 7. Capturing data from a telnet connection. Once you have opened the VDP Designer, you will see two tabs: Text Layer & Design Layer. 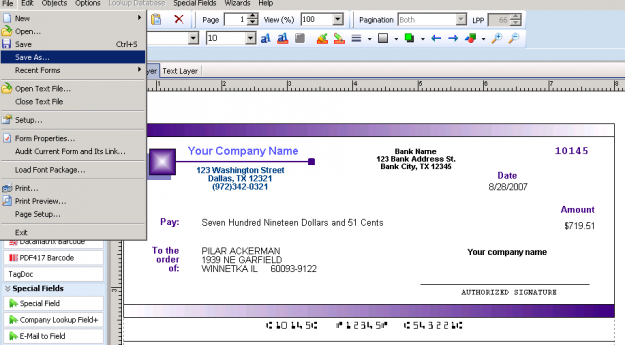 You will be using the VDP Designer to create or edit the Form overlay for the final output. Once the Form overlay is created, it will be used by the Reform Spooler each time the related text/ASCII file appears in the Spooler directory. Important: Please refer to the Reform_Server Manual to learn more about the Reform Spooler. Start by selecting New from the File menu, and choose a form template from the list that matches the type of information you are using. If none of the templates matches your information, click the Blank Form button. Text Layer contains the information generated by your application. Design Layer defines the appearance and layout of the form that you design. See Tips & Techniques for ideas about how to create your own desired Reform formats/overlays. The Design Layer is the layer that holds graphical objects on the form. It works like a design canvas where you can add borders, frames, text and images (such as your company logo). The final output will resemble the layout and content of the Design Layer. The Status Bar provides information about the file name and the object currently selected. The right-hand side of the status bar will always display the type of object that is currently selected. This is helpful when there are many objects on the screen and you want to know what it is you are selecting. Aligns the selected objects to the grid. Adjusts the scaling factor (%) to achieve the desired design view. The page number selector advances through the different pages on the Text Layer. By doing so, you can make sure that the text appears and is properly distributed in the Design Layer. The new object inspector allows you to easily select and edit form objects. 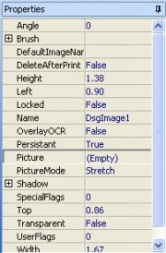 Within the object inspector you can edit all properties such as color, size, font, brush etc. You can also reorder, group and align objects. The available objects are easily accessible on the left side of the VDP Designer. The VDP Designer Toolbar puts all of the frequently used design features in a convenient location so they can be quickly accessed. This part of the toolbar will allow you to align your text horizontally and vertically. Select the Design Text object you would like to align and click the appropriate button to align to the left, right, or center. Click the vertical alignment button to change the position of text within its boundaries. 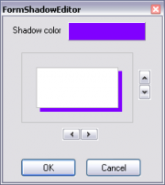 Click the Shadow button to bring up a menu that allows you to place a shadow on any object that is visible in the Design Layer. To change the color, click the colored box and bring up the palette. To change the angle and size of the shadow, click the directional arrows to change the object’s dimensions. To easily create different shapes on your forms, click the Shapes button on the toolbar to bring up the Shapes menu. Click one of the shapes, and draw it out on your form. This will only work in the Design Layer. First, click on the object you want to add a gradient for and set the Gradient->Visible property to True. Click the Gradient button on the toolbar, click Start Color, and then pick a color to start the gradient with in the dialog that shows up. Then, click End Color, and choose the ending color. Select a direction for the gradient to fade. The gradient should now be visible. 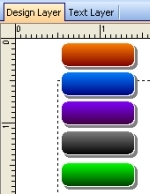 You can change the gradient colors and direction at any time, either by using the buttons on the toolbar or the properties in the properties panel. The Purpose of the Text Layer is to provide a visual area in which to view the content of a spooler file, and map specific information for inclusion in a form overlay during the design process. The Text Layer displays text exactly as it appears in the text file, which generally reflects the positioning and layout of text generated by the printing application. To obtain the spooler file generated from a print job for the purposes of creating or adjusting a form overlay, select Open Text File from the File menu, and locate your file. 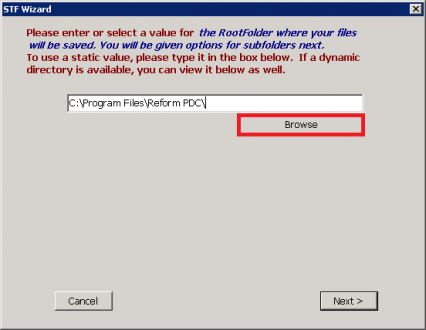 If you have no spooler file available in the Reform…\Spooler\ directory, make sure the Reform Spooler is turned off and you have printed from your application to the Reform Server. Printing to the Reform Server can be done either by using the Reform Printer Driver, or a method for capturing data from a host system). The text file should be located in the Reform Spooler directory. The Paginate Method dropdown list allows you to configure Reform to look for Form-Feed characters or use a specific number of lines per page to break the spooler file into individual pages. Form-Feed Char will look for the character (ASCII value 12) that signifies the end of a page. Lines Per Page will use the LPP number you choose and paginate each print stream every X number of lines. Choosing Both will attempt to break it up by Lines Per Page, but if a Form Feed character is found before it reaches the Xth line, it will break the page at the form feed character. Use this control to adjust the number of lines per page of the text file. When the Spooler processes a print stream on this form, the print stream will be broken up into separate pages by increments of this number. For instance, if you send a 150 line print stream through to this form, it will break the stream up into 3 pages, the first two containing 66 lines each, and the third containing 18 (totaling 150). This is used primarily if you print stream is not able to insert form feed characters between pages. This allows multi-page print streams to be broken up based on the number of lines per page. Be sure to adjust Lines per Page correctly, or your final output page may be misaligned. The Page Selector allows you to scroll forward and backward through the pages of text in the Text Layer. It also allows you to zoom in to precisely move objects on the Design Layer. It uses the Lines per Page setting and/or form feed characters embedded in the text file to determine where pages begin and end. 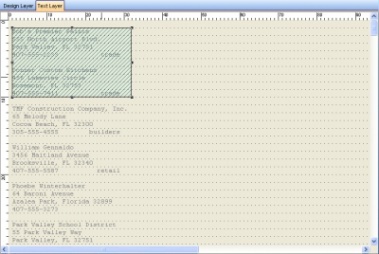 The BreakPrintJob property on a Special Field object allows the print job to be divided up based on a value that changes throughout the document. For example; if we wanted a batch of invoices to be broken up by the invoice number (a different PDF saved for each invoice, etc. 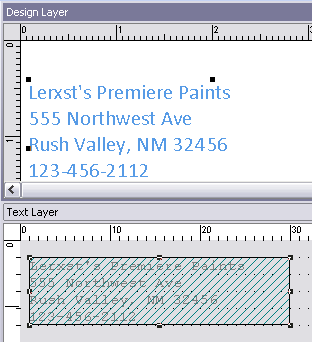 ), a Special Field can be mapped over the invoice number on the text layer with the BreakPrintJob property set to True. This will create a separate PDF each time the invoice number changes in the data file. The Mapping Area is the rectangular region that causes the text beneath it to appear on the Design Layer. To crop portions of the text document, while you are in the Text layer, create a new Link Text object and drag/size it over the text you want to use on the design layer. When enabled, this feature will save digital copies of any documents that are printed to the FabSoft Reform Printer. When the print stream is generated, the first line of the file will be a path to the saved image. This path can be mapped using a Link Image object on the Text Layer to display the saved image on your form. 1. In the Control Panel, select Reform Port Monitor Setup. In the Advance tab, check the box labeled Retain Images. 2. Print from your application to the FabSoft Reform Printer. 3. 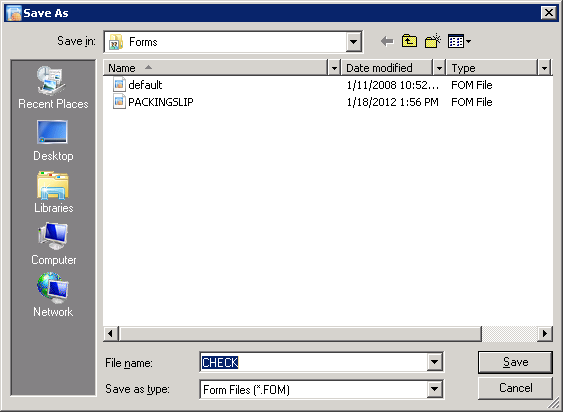 In VDP Designer, select Open Text File from the File menu. Note: At this point you should see a file created in the Spooler directory, and an image file for each page in the print stream will appear in the Spooler\ImageQueue directory. If you were to create a Link Image object in the Text Layer and map it over the path to the file, the image will be displayed in the Design Layer. When designing a form overlay, it is always a good idea to print a test file from your application that fills up the entire length of each of its data fields. 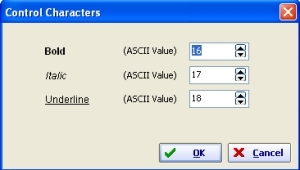 For example, if the customer name on your test file is FabSoft and it is 7 characters in length, but the user prompt can contain a customer name that is 20 characters in length, filling up the user prompt with 20 characters will help avoid any truncations in the final output of your print jobs. 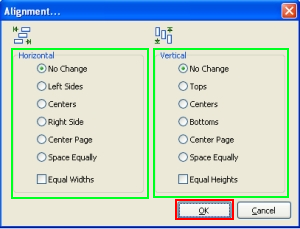 The header, body and footer areas should remain the same height on both pages of a two-page document. To avoid any possible format changes in the second page, a test file should take up more than one page. If they change, you may need to use the Scripting Plug-in to make adjustments to the text positioning using a Reform Page Process Script. If more advanced adjustments are required, a Decision Maker script may also be used. Item Detail Section: If the Text Layer contains information spread over a large area, you will need to map the maximum area allowed to avoid any truncations. Reform uses a copy and paste method when mapping text from the text layer to the design layer, so it will not matter if the item detail area has one item or the maximum number of items. The easiest and least flexible mapping method is to select the entire area using one paragraph object, while using a mono-spaced font such as Courier New or an after market mono-spaced font. Mono-spaced fonts make it easier to retain the text formatting generated by the printing application because the character spacing is consistent. The recommended method of covering a large area is to map each column individually. 1. Change the font to any type. 2. Justify the text left, right and center. Certain columns look much neater when they are center-justified, while other columns will look better left/right-justified. 3. Rearrange the columns on the Design Layer. 4. 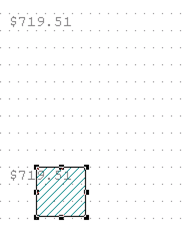 Remove columns from appearing in the Design Layer. If, for instance, the difference between an order and a picking ticket is that one contains the price and one does not, you can simply delete the price column from the Design Layer when designing the picking ticket. This alleviates having to re-map entire regions of information over and over during the design process. Opens the Reform help file. You can use the combination of CTRL and the Arrow keys to move selected objects one pixel at a time. This can be useful in fine tuning the placement of the objects in your forms. You can use the combination of SHIFT and the Arrow keys to resize the selected objects one pixel at a time. Opens the text file to be used for the form design process. The text file’s contents will appear on the Text Layer, ready to be mapped. *Note: When a text file is loaded into the Text layer in Reform, the file will be locked, and as such, cannot be modified or deleted. If you are trying to delete a spooler file manually and it is giving you an error, make sure that file isn’t still open in Reform. Closes a text file and removes it from the text layer. Change some of the back-end options for Reform, including application paths and special settings. Change several form settings, such as Page-Process Scripts, Form Linking, Background Image etc. You can manually load a font package created from a Retained Images print action. Font packages are usually found in the Spooler\ImageQueue directory. In here you can choose if you want to send your document to a printer or to a device script. You can also configure the corresponding settings for each. This includes the page dimensions, margins, and printer profiles (if a printer is desired). Attachment settings are also available such as PDF, TIF, or other image settings (if a device is desired). When you choose New from the File menu, Reform displays a dialog prompting you to make a selection from a list of available templates. If none of the available templates suit your purpose, click Blank Form to create a new form or template. When you select a template, Reform creates a copy of the template as a new form overlay for you to edit and modify. Form files are the files that the Spooler uses in conjunction with the text files generated by your application to generate the final output of your print job. They should always be associated with a text file. Note: We recommend that you save all forms in \REFORM…\FORMS directory. New forms can be derived using the Template file forms. These are the forms that will appear under "New..." dialog. They must be saved in the Templates folder in the Reform directory to be displayed in the Template list. Note: You can change a form overlay into a template by simply changing its extension to .FTM and placing it in the Templates folder. The Design Layer displays exactly what the printer will print out. 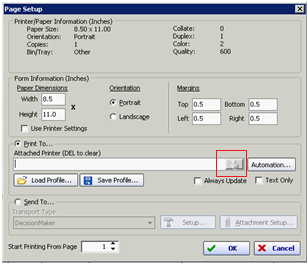 Clicking Print will allow you to process your form overlay with your print stream (if a text file is open) and have it sent to the Send-To Device or Printer that you selected in Page Setup. This manual way of printing can be used for the purpose of testing and perfecting the look of your file output. This is essentially what is happening "behind the scenes" when the Reform Spooler matches up a print stream with a form. Removes the selected object(s). Cut objects can be pasted back onto the form using the Paste command. Copies the selected object. Copied objects can be pasted multiple times to facilitate easier form design. Paste back the previously cut or copied object(s). You can paste multiple times (before performing another cut or copy action) to create duplicates of those objects. Brings up the Grid Settings dialog. 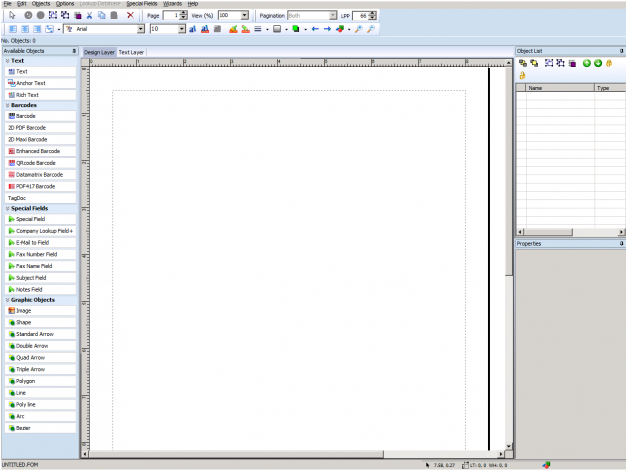 This dialog allows you to adjust the grid spacing per inch on the Design Layer. Align the selected object(s) to the grid. Reset all of the frames in the Design layer to their default positions. Toggle on/off the bounds indicator of each object. This option is on by default. Check this off to improve the response when scrolling the page. This allows you to manually select a cover page to be used with faxes. If you are using email integration on your form, the email addresses you are sending to may have a specific prefix or suffix that you need to change. Rather than hard-coding this into the script, you can type the prefix or suffix into this window to automatically reformat email addresses. _richtext = "AAAA" + "BBBB" + "CCCC"
_richtext = "AAAA" + chr(16) + "BBBB" + chr(16) + "CCCC"
As you can see, you can change the text formatting by encasing the chosen text in the appropriate ascii characters. It is used in an open/close fashion. 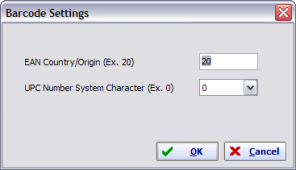 This feature reduces common errors that occur when improperly using the Form Key Field. 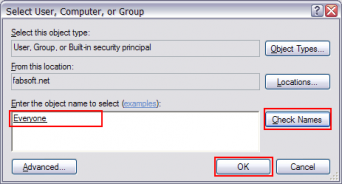 Check Form Key Field checks the validity of a Form Key Field. If the content of this field does not match the form name, Reform will prompt you with instructions on how to resolve the problem. See Form Key Field for more Information. From this sub-menu, you can launch the Script Debugger and open all scripts associated/used with the current form, only open the page-process script, or only open the device script. Special fields are used to pass information to the devices that Reform communicates with, such as printers, fax systems, email systems, etc. The only special field available with Reform Standard is the Form Key Field; all other fields are Enterprise/PDC only. The Form Key Field is used by the Reform Spooler to associate a print stream with a form when there is a recurring string in the text file at a specific spot. When a text file is detected in the Spooler directory, Reform opens the text file and compares the file contents underneath the Form Key Field against the list of available forms. If the content matches one of the form names, the Reform Spooler uses that form to process the text file. When you add the Form Key Field, you should notice a red rectangular region on the Text Layer. The Spooler opens the Text/ASCII file and searches through the list of Form Keys. To set up the Form Key option, click on Form Key Field under Special Fields in VDP Designer (must be on the text layer). To verify that you have set the reference correctly, go to Check Form Key Field under Options. 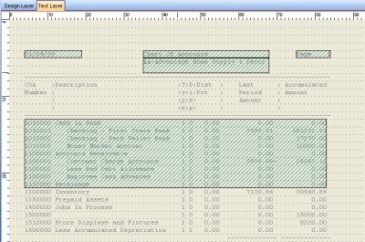 In the above picture, the field mapped on the text layer is large enough to cover different scenarios (Invoice, Processing, Ipsum). If the mapped area starts with any of the words found in the SecondaryKey property, then the form key will match. Text is matched left to right, and will match only if the mapped area begins with an expected secondary key. The Spooler attempts to match a Text/ASCII file with a form of the same name. The file extension is ignored. If a report is printed to a file called ORDER.OUT in the C:\Program Files\Reform…\Spooler\ directory, the Spooler looks for a corresponding ORDER.FOM file in the Reform…\Forms\ directory. When found, it will open ORDER.OUT and ORDER.FOM for processing. Note: The filename will be ignored if the Spooler finds a form and a text file that meet the criteria for the Form Key Field. 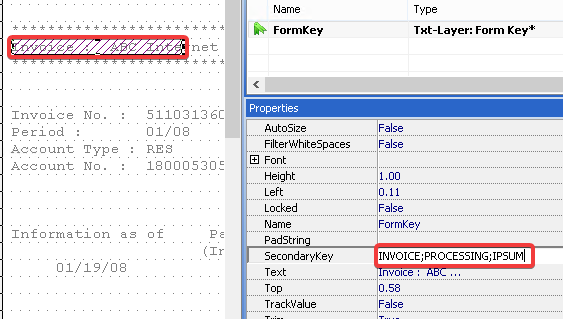 If the Text/ASCII file does not qualify for the first two methods, the default form (default.fom) will be used. If the default form does not exist, the Spooler will ignore the Text/ASCII file. If you are planning to use a fax or email device, this field must be included on the form overlay. This field is used to look up the company name in the Lookup Database. When you add Company-Lookup Field to a form, a red mapping box will appear. The Company-Lookup field is invisible to Reform; therefore, you can place this field anywhere on the Design Layer and it will not show up in the final output. In addition, it can be used to fill in Company Name for your email or fax device as well. To enable the lookup abilities, the file "LookupAdo.fpg.remove" in the Reform…\Plug-ins\ directory must be renamed to "LookupAdo.fpg" Once this is done, the VDP Designer and Spooler will need to be closed and opened (or restarted). When you add it onto the Text Layer, its content is determined by the text enclosed within the mapping region. Therefore, you cannot edit the content of this field. Map the entire company name section on the text file, and the form will look for the company name in the database every time it is used. If a corresponding company name is found, it will then be able to use any associated information (such as fax numbers or email addresses) that it finds. These fields are used to extract fax information directly from the text content. They are invisible to Reform, and thus can be placed anywhere on the Design Layer without appearing on the final output. Certain fax devices may or may not use all of the fields. Any fields that are not applicable will be ignored. 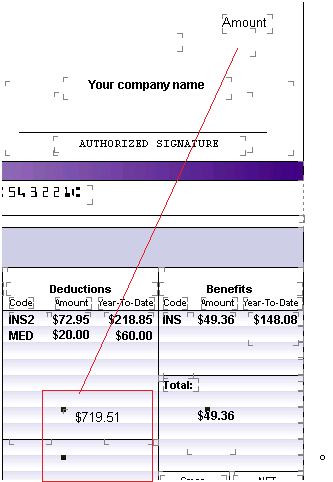 Note: You must include the Company-Lookup field in your form overlay in order to initiate the fax automation feature. This field is used to fill in the contact name when applicable. This field is used to fill in the Subject when applicable. This field is used to fill in notes when applicable. In addition to the Company-Lookup Field, you can also include these email fields in your form overlay. Email fields are a group of fields that help manage Reform’s email functions. These fields are invisible to Reform, and can be placed anywhere on the Design Layer. These fields are used to fill in necessary information required by the email system. Note: You must include the Company-Lookup field in your form in order to use the email feature. Include this field on your form if the sender’s name appears in the Text/ASCII file. This field does not have to be an email address; it can be anything that indicates the sender’s name. This field is only applicable when using the SMTP feature of the email Plug-in. This field is ignored when using MAPI. Include this field if the recipient’s email address appears in the Text/ASCII file. Reform will use this field to get the email address instead of looking for one in the Lookup Database. This field is used to fill in the subject of the email. Any text that this field contains will be used as the email subject. This field is used to fill in the body of the email. Any text included in this field will appear as a message in the email body. Wizards can automate tasks that may be tedious or require many steps to set up properly. They all use a very simple format to gather information from you and set up your form. 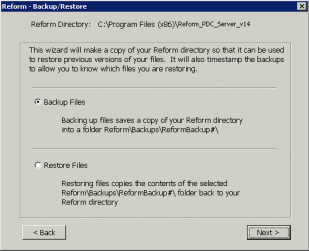 This wizard will create, manage, and restore backups of your entire Reform directory. This includes forms, backup files, page scripts, device scripts, and settings. This is useful if you have a large workflow consisting of heavily modified scripts and forms that you need to back up often. On the first screen, it will ask you whether want to make a backup or restore a backup (The Restore Files option is not visible if there are no backups currently saved). Step through the screens and the backup will begin. If you select Restore Files, it will allow you to select a date and time that you would like to restore to. Select an item and click Next to begin the restore process. The CSV Wizard will allow you to select a CSV file, and it will then create a special field box over each line of text in the selected CSV file. The CSV file will be broken down into separate pages by line, and then added as the Text File in Reform. The text maps can all be modified in the VDP Designer. This is the SampleCSV.csv file, found in the /Reform…/Misc folder, after it has been processed by the CSV Wizard. Each page in the text layer is now a row of the CSV file. This wizard will create multiple pages for forms that look very similar but perform different tasks. For instance, you could run this wizard to create several forms that create a customer copy, an internal copy, an archive copy, etc. It also allows you to select the send-to devices right from the wizard screens, as well as change the amount of copies to be made. You can modify the Send-To Device for each one. Copying and linking multiple forms can be time consuming, but the Pre-Printed Forms Wizard does all of that for you—you simply enter the number of copies needed. This wizard will allow you to select several destinations that you want to send a form to. It will repeatedly let you choose different destinations to send your form to, and then it will create all of the necessary forms, set and configure the scripts, and link the forms together. Enter the text that describes the form overlay; this is viewable in the Reform Spooler. Specifies the form overlay to be linked to the current form overlay. This signals Reform to perform a Form Link process. 1. Normal - The current form is used to print all the text pages. Once finished, the linked form is then used to print all the text pages. The process repeats until all linked forms are processed. See How Form Link Works for more information. Note: In order to prevent an endless link process, circular linking is not allowed. Reform automatically detects a circular link and will end the process. 2. Collate - Processes each linked form for each page in the text layer; this method reproduces pre-printed multi-part forms. See the section on Collating in How Form Link Works for more information. 3. Advance Page - This allows Reform to print using the current form for the first text page, then the linked forms for the next consecutive pages. This continues until there are no more text pages. See the section on Advance Page in How Form Link Works for more information. Use Duplex printing to print on both sides of a page. Certain printers are capable of printing in duplex mode. If your printer supports duplex printing then you can take advantage of this feature. The form specified in the Duplex Form Name box is the form that will be printed on the backside of the page. This information is stored along with your main form; therefore, each form can have a different duplex form attached to it. 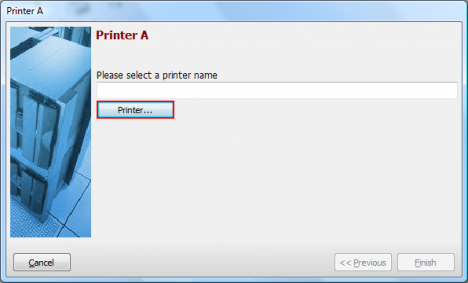 Note: Both forms must have the same printer definition set in Printer Properties, and the duplex option must be activated in the properties setting of each printer. Form Password allows you to password-protect an important form overlay (such as a check or purchase order) from any unauthorized modification and/or printing. 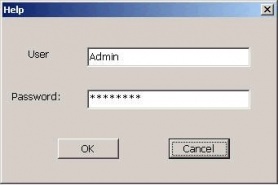 To password protect your form, simply type the password you would like to use in the Enter Password and Confirm Password boxes. To prevent unauthorized printing, check the Password on Printing box. Otherwise, leave Password on Printing unchecked so that any user can print the form; however, you will not be able to modify it without the password. The Background Image is an image that occupies the entire page. If you have a pre-printed form that you need to import into VDP Designer, simply scan the form you have into an image and use the image as a background. You can also use the background image as an embedded watermark. Use the language drop down list to select the language for the form. 1. Open the Form Properties dialog box by selecting Form Properties from the File menu. to the right of the text field titled Link Form Name. This opens the Form List window, which displays every available form. 3. Scroll through the list of available forms until you find the one you’re looking for, and highlight the form by clicking on it. 4. Click OK. The selected form will now appear in the Link Form Name field in Form Properties. 5. Click OK again to return to VDP Designer. 6. 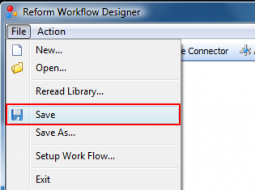 Save the form by selecting Save from the File menu. The two forms are now linked together. If you wish to add more forms to your Form Link, repeat this process by creating a link reference to the third form in the second form, to the fourth form in the third form, and so on, until all forms are properly linked. You may link as many forms as you wish. 7. You can test the form link by selecting Print from the File menu in the first form. If every linked form prints out in the desired order, your Form Link is working. Form Link is a powerful feature, and when used correctly it can save a person, department or company hours of work that would otherwise be spent manually sending faxes, composing emails and printing hardcopies. With Form Link, all these interrelated tasks can be accomplished at the touch of a single button. Each form in a series of linked forms can be sent to a different output device. For example, the first form can be sent to a laser printer, the second form can be sent to a fax machine, and the third can be sent to the shipping printer in the warehouse. More forms can be added to the chain and automatically routed to multiple different departments, email addresses, fax numbers, etc., facilitating the accomplishment of potentially hundreds of otherwise tedious activities. This is the standard method of using Form Link, which processes each text page for each form before moving on to the next. Assume that you want to generate a 3-part output and you’ve already designed 3 different form layouts using the same information: FORM1.FOM, FORM2.FOM and FORM3.FOM. You would link FORM1.FOM to FORM2.FOM and FORM2.FOM to FORM3.FOM per the instructions at the beginning of this section. FORM1.FOM is the initial form that you use to print your document. When the printing process begins, Reform uses FORM1.FOM to print every text page, then FORM2.FOM for every text page, and finally FORM3.FOM for every text page. Because FORM3.FOM has no reference specified in its Form Properties, the printing stops after FORM3.FOM is processed. Form Link can be set to collate your printed forms. Using this method, each page of your document will be printed on every linked form before Reform moves on to the next document page. This simulates pre-printed forms that you would typically find on a line printer. 1. Make sure your forms are properly linked together. 2. With Form 1 loaded into the VDP Designer, go to File on the menu bar and click Form Properties. 3. In the Link Mode dropdown box, select Collate. 5. Click OK to close the Visual Link window, and click OK again to close the Form Properties window. 6. Save your form to insure that all changes take effect. When the above steps have been completed, your forms will print out collated. Note: It is only necessary to activate this feature on Form 1. The Link Mode for all other linked forms should be set to Normal. To stop the forms from collating, simply set the Link Mode on Form 1 back to Normal. 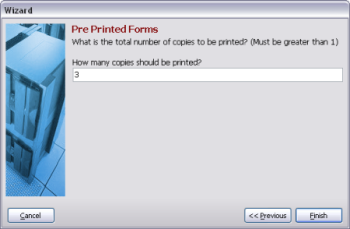 You can also print collated forms from separate printer trays. See Printing from Multiple Trays for more information. Form Link can also be set to print using a different form for each consecutive page of your Text/ASCII file. The first page is printed to one form and the next page is printed using the linked form. The process continues until there are no more text pages to process. Assume that you want to print using a different form for each consecutive text page: FORM1.FOM for page 1, FORM2.FOM for page 2 and FORM3.FOM for page 3. You would link FORM1.FOM to FORM2.FOM and FORM2.FOM to FORM3.FOM as usual, but instead of leaving the Form Link reference for FORM3.FOM empty, set it to link back to FORM1.FOM, causing it to cycle through every form again, in a perpetual cycle until it runs out of text pages. To achieve this, the Link Mode for each form must be set to Advance Page. If any of your linked forms’ Link Mode is not set to Advance Page, the form will loop on itself until it reaches the final page of the Text/ASCII file. The loop back can be referenced to any linked form. For example, if you link FORM3.FOM in the above example to FORM2.FOM, the forms will continue to loop from FORM2.FOM to FORM3.FOM, bypassing FORM1.FOM for every page except the first. A Common Scenario: If your text file contains a cover or start page, you can create a form for the cover page, and a second form for the accompanying information. After linking the two forms together, set the first form’s Link Mode to Advance Page. In the second form, do not select a Link Form Name. This will cause the cover page to be processed for the first text page, and the second form will loop on itself for the remaining pages of the print job. Forms can also be used to process a print stream using the LoadForm() function with the Scripting Plugin. This will forward the print stream to the form you wish, and it will be processed. The Form Editor uses an object-oriented approach for form design. Each element on the form is treated as an object. 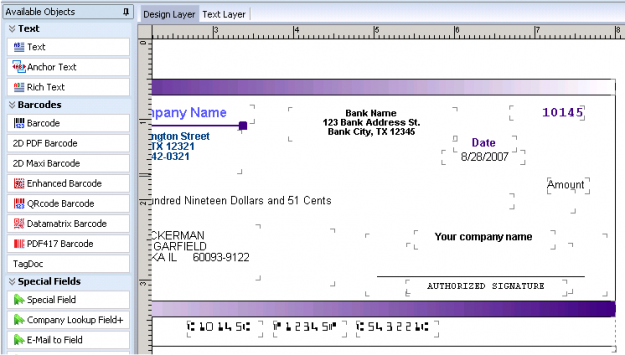 There are four basic objects you can add to a form: Shape, Image/Graphic, Barcode, and Text. To select an object, simply click on the object you want to manipulate. If two or more objects overlap one another, you can right-click the top object and select Send to Back. This will cause the object beneath it to become fully visible. Once the intended object is in front, it can be selected with a simple mouse click. Each object has its own properties (color, line width, text alignment, etc). You can access the properties of an object by selecting the object as described above. The properties for that particular type of object will be populated into the Properties panel. The Object Properties dialog box. You can move, resize, and rotate objects by using the mouse. To move or resize an object, first select it by clicking the left mouse button. A map mark will appear around the object, indicating that it is selected and ready to be moved or sized. To rotate an object, click and drag the anchor on the object. To add an object to a form, click one of the object-creation buttons (see Available Objects, above), and click and drag out the object on the Text or the Design Layer. 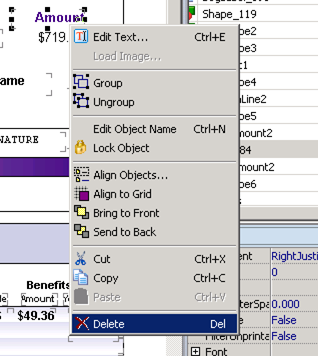 To delete an object, select the object you want to delete, and then select Delete from the Edit menu. You can also press the Delete key on your keyboard. Alternatively, you may right-click the object and select Cut from the dropdown menu, or press CTRL-X. To move an object, place the mouse inside the boundaries of a selected object, hold down the left mouse button and drag the object to the desired location. You may also use the combination of CTRL and the Arrow keys to move the selected object one pixel at a time. This can be useful in fine-tuning the placement of the objects. 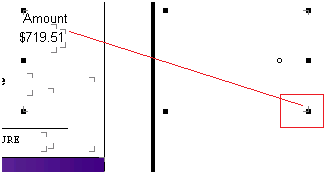 To size an object, move the mouse toward the edge of the object until the cursor changes to a diagonal arrow shape. Hold down the left mouse button and drag the corner or side of the object. It will grow and shrink with the movement of the mouse. When the object reaches the desired size, you can release the left mouse button. You may also use the combination of SHIFT and the Arrow keys to size the selected object(s) one pixel at a time. This can be useful when fine-tuning the size of an object. To rotate any object, click and drag on the circular anchor. In the image below, it is on the right-middle of the box. When you click and drag it, you can rotate it to any position you want. 1. It is hidden. The text selected by the Linked Anchor Text Object is not displayed at the time of print. 2. It is used in association with a Linked Text object. To associate a Linked Text Object with the Linked Anchor Text Object, you need to modify the Child Controls property by clicking the … on the property line. A window with more options will open. Click on the Attach Objects… button and select the object(s) you wish to attach, then click on OK.
3. It can be used to control display of the Linked Label Object based on keywords. This is enabled by checking the "Hide Attached Obj. When Not Found" option. An object must be attached for this option to work. 4. It can track keywords within a specific column (vertical search) or row (horizontal search). 5. Tracking can be restricted by locking search positions on the left, right, top or bottom of the Linked Anchor Text Object. For instance, if you know the keywords only appear below the placement of the object and to the right of the object, the left and top side of the object can be locked. If the text to track always appears in the same location, you may restrict tracking by locking all sides of the object. If you want tracking enabled on all sides, uncheck all lock options. A company prints a batch of multi-page purchase orders which always displayed the subtotal on each page and displays only the final total on the last page. The last page also shows the word "Total" before the actual total amount is displayed. Furthermore, the total amount displayed shifts vertically and does not always appear at the bottom of the page. Instead of printing the subtotal on each page, the company wants to display only the final total at the end of the purchase order. This company chooses to use the Linked Anchor Text object to accomplish the task. 1. Make sure you are working in the Text Layer. 2. Click on the Label Object icon to create a new Linked Label Object. Follow the rest of the instructions above to move, size and position the Linked Label Object. Please remember to give the Linked Label Object a name. 3. 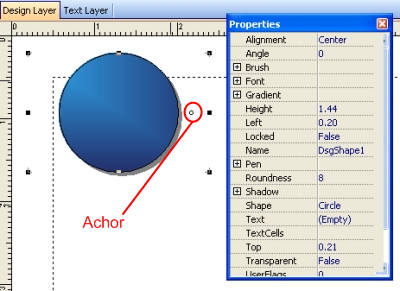 Next, create a Linked Anchor Text Object on the text layer. 4. Move and size the Linked Anchor Text Object until it overlays the desired text content. 5. Click on the Linked Anchor Text object and look at the properties panel on the bottom right of the screen. Change the anchor properties. 6. Name the Linked Anchor Text appropriately. 7. Enter the text to track. In this case, the user enters the word "Total". If the word "Total" shifts vertically, the user may choose to restrict the text track to vertical movement by locking the horizontal movement (lock the left and right sides of the object). 8. Modify the Child Controls property by clicking the … on the property line. A window with more options will open. Click on the Attach Objects… button. Select the Linked Object Label that you wish to attach to this Linked Anchor Text Object. In the example above, the user would attach the object selecting the subtotal/total amount field. 9. For the example above, the user will then check "Hide Attached Obj. When not Found." Using this option, if the Linked Anchor Text Object does not find the word "Total", the attached object (which is highlighting the subtotal/total amount), will not be displayed. However, if the Linked Anchor Text Object finds the track word "Total", the Linked Object Label displaying the dollar amount will be displayed. To preview the results, go to File>Print Preview. The Text Object is used to create single and multiple lines of text. Depending on which layer you create this object in, the behavior can be very different. Please read on for more information. 1. Make sure you are working in the Design Layer. 2. 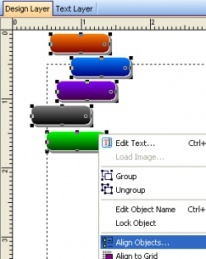 Click on the Text Object icon, and click and drag on the Design Layer to draw a Text Object. 3. The properties pane on the bottom right will change and allow you to change multiple properties of the Text Object. 4. 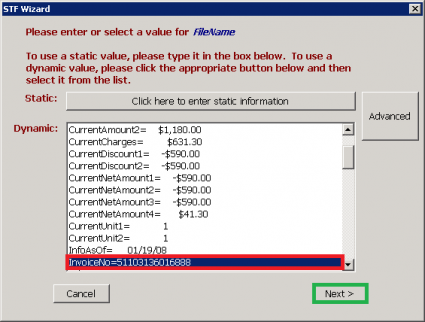 Modify the Text property by clicking the ... button on the Text property line. 5. Click OK. The Text Object will now contain the text you typed in step 4. Position this anywhere on the screen. Modify the Text property at any time to adjust the appearance of the text. 3. Move and size the Text Object until it overlays the desired content. 4. Go to the Design Layer. The Linked Text Object and the text it overlays will be displayed on the form. You may alter the position or properties of this Text Object the same way you would a standard Text Object. Note: If the position or font properties of the Linked Text Object are altered on the Design Layer, it will not affect the position or appearance of the same text in the Text Layer. The Rich Text Object is a specialized object used to map text that contains ASCII control characters. 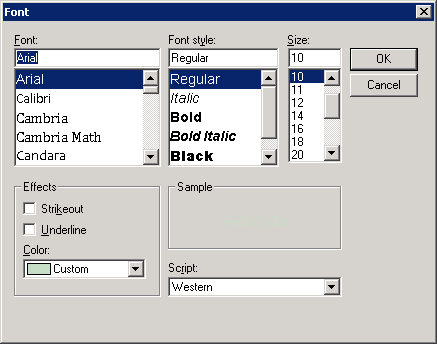 These control characters are used for various formatting functions, such as bold, underline and italics. If your application is capable of printing these characters, the Rich Text Object must be used to maintain the formatting implied by the use of the control characters. In the following example, the parenthesized numbers are representative of control character number 16, which is interpreted by Reform as a bold formatting character. All control characters will actually appear as small rectangles in the text layer. icon to create a new Linked Rich Paragraph Object. 3. Move and size the object until it overlays the desired content. 4. Go to the Design Layer. The Linked Rich Text Object and the text it overlays will be displayed on the form. You may alter the position or properties of this object the same way you would a standard Rich Text Object. Note: If the position or font properties of the Linked Rich Text Object are altered in the Design Layer, it will not affect the position or appearance of the same text in the Text Layer. The control characters can be changed to fit your needs. To access the Control Characters dialog, select Rich Text Control Chars from the Options menu. The dialog box pictured below will appear. To modify the ASCII values used to represent different formatting options, simply click the up or down arrows to the right of the number boxes. 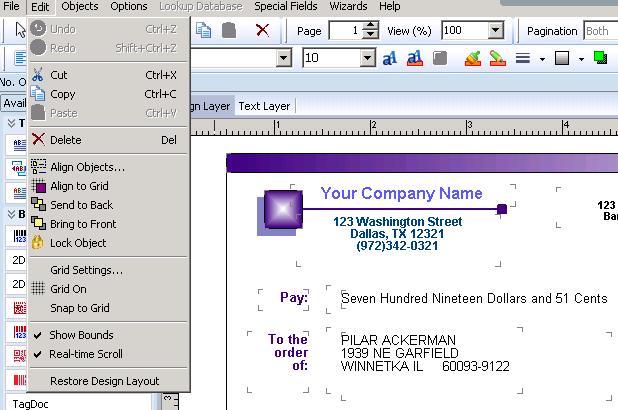 The OCR Text Object is used to capture text from scanned documents. 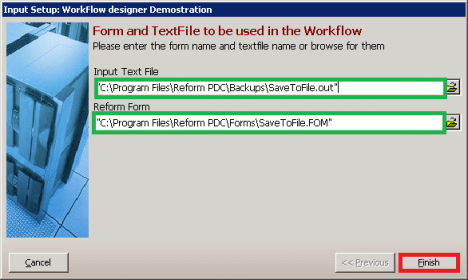 The two easiest methods of getting a scanned document into Reform VDP Designer is by either using the MOST plugin or the ImageToReform Plugin. For this example we will be using the ImageToReform Plugin. The ImageToReform plugin works by monitoring a folder for scanned images and sending them to Reform. The scanned image can be of either JPG or TIFF format. The plugin monitors sub-directories located in \Reform…\Plugins\ImageToReform\In\ for images. The name of the sub-directory should be the same as the form name that Reform will use to process the image. For example, if we wanted our scanned image to be processed using a form called "Invoice", we would create a folder with the name "Invoice" and scan the image to that location. When you scan an image from an MFP and point it to this folder, ImageToReform will detect it and the file will be moved out of this location. In this example, a text file will be made for Reform to process using the "Invoice" form. Opening that text file in VDP will show the scanned image which can now be used alongside the OCR Text Object. If there was a form already created called Invoice, the text file will be found in the \Reform…\Backups\ folder. If the Invoice form was not yet created, the text file can be found in the \Reform…\Spooler\ folder. 2. Click on the OCR Text icon. Click and drag to create a box. 3. Position the box over the area on the image where text will be captured. 4. 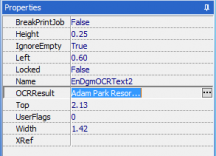 In the below example, we have positioned the box over "Adam Park Resort". Now that the OCR Text Object has been placed over the desired area, the results can be checked. To see the results, first click Options in the menu bar, then Refresh Zone OCR Results. This will cause the OCR Text Object to detect any text within the box. The option Auto Refresh OCR Results will automatically refresh the OCR Text boxes. Once the OCR Results have been refreshed, the OCR Text Object that was placed on the form should now show the recognized text in red overlayed on top of the box, as shown below. To get a better view of the recognized text, clicking on the three dots next to OCRResult in the Properties window will open up the results in a sperate window. Note: Text in this windows is not editable. 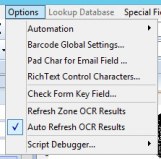 Clicking … will open the OCR results in a window. The "BreakPrintJob" property can be used to separate print jobs based on the value of the detected text. For example, if several invoices were scanned in at one time but we want to treat each as a separate print job, we can use the OCR Text field on the invoice number with the "Break Print Job" property set to True. The Shape Object is used to create frames, lines, rectangles, squares, arrows, and circles. 2. Click on the Shape Object icon. Click and drag to create a box. 3. You may change the shape and properties of the Shape Object by clicking on it and then modifying the properties in the Properties panel. 4. Alternately, if you want to simply create a shape without having to change properties first you can select one of the shapes available under Graphic Objects. The Barcode Object converts text content on the Text Layer into a specified barcode representation on the Design Layer. 2. Click on the Barcode Object icon. Click and drag on the text layer to create the Barcode Object. The object appears as a bluish mapping box. 3. 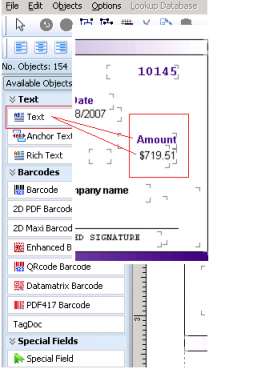 Drag the Barcode Object so that it overlays the desired text content. 4. Go to the Design Layer. The Barcode Object will appear as a graphical barcode. 5. Click on the object and modify the properties to alter the barcode’s type, size, caption, appearance and other properties. The Barcode Settings (which differ from its properties) may be accessed and modified by selecting Barcode Global Settings from the Options menu. EAN 8 and EAN 13 require 2-digit country or origin code. 1. UPC requires a number system character from 0 - 9. This additional information will be applied to the newly added barcodes (depending on the type of barcode you choose), eliminating the need to individually specify this information for each of the barcodes you add. After the barcode is added, you can manually alter these values in the Barcode Global Settings dialog. The Image Object is used to add graphics to your form. The supported graphic types are BMP, JPG, GIF, TIFF and EMF, however, the recommended image type is BMP. You can use this object to import your company’s logo, backgrounds, digital signatures, etc. 2. Click and drag out an image object in the Design Layer. 3. Click on the image object. 4. In the Properties panel, change the Picture property. 5. When you find the desired file, click on the file name and press Open. The image that you selected will now be displayed in the Properties panel. 6. The desired image will now appear in the Image Object on the Design Layer. Note: If the box labeled PictureMode has been set to Stretch in Properties, you may resize the picture to your specifications. In Stretch-mode, resizing the Image Object causes the image to grow and shrink accordingly. If the PictureMode property is not set to Stretch, however, the image will appear at its standard size, and adjusting the size of the Image Object will not affect the size of the image. Stretch may slow down the processing speed of Reform, since the image has to be resized each time. To optimize an image, use a graphing program to resize the image and reduce colors. The Properties panel when you have an image object selected. Sometimes objects appear out of alignment, and it becomes necessary to align them to each other in order to maintain a uniform and professional appearance. In VDP Designer, this is a quick and easy process. 1. Select the objects that you wish to align. You may select multiple objects by holding down the Shift key and clicking on each object you wish to select or by dragging your mouse over multiple objects. 2. Right-click on the object that you wish the others to align to, and select Align Objects from the popup menu. 3. In the Alignment dialog box, select the alignment method that you would like to use. 4. Click OK. When you return to VDP Designer, the objects will be perfectly in line. The objects are now all aligned to the green button, because the green button was first clicked on. The Linked Image Object is a unique and powerful feature that causes images on a form to change based on text content in the Text Layer. If, for example, you wish to include graphical representations of products on a specific form, the Linked Image Object can be set to display a product’s image by reading its name or product ID from the Text/ASCII file during the printing process. To use this feature, the name of the graphic file must be the same as the text content mapped by the Linked Image Object. For example, if you would like to have pictures of your inventory displayed on the invoice, you could use the product’s item number as the image file name. If the item number is E10034, for instance, and you have a bitmap image of the item, then the bitmap should be saved as E10034.BMP. When Reform processes a form containing Linked Image Objects, it looks for the first image with a name that matches the text content. Follow the steps below to configure a form to use a Linked Image Object. 1. To set Reform to retrieve the pictures, you must first specify the location of the graphic files. To do this, Select Setup from the File menu to call up the Setup dialog. 2. In the Setup dialog, make sure the Image Directory points to the correct folder. The default folder is C:\Program Files\Reform…\Images. You may use this folder or specify a new one. 3. Click OK to return to VDP Designer. 4. Now you are ready to create your Linked Image. Make sure you are in the Text Layer, and click the Linked Image Object icon. Click and drag a box on the text layer to create your Linked Image Object. 5. Move and size the box so that it covers the desired text content. 6. Go back to the Design Layer and right-click the object to view its Object Properties. Default Image allows you to select a default image for use if Reform cannot locate a file specified by the mapped text. To disable this, simply leave the field blank. 7. The image displayed in the Linked Image Object can also be controlled from a Page Process Script. 1. Display a salesperson’s picture on the Invoice using their ID. 2. 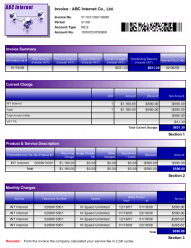 Display pictures of items on an invoice using the item numbers or SKU. 3. 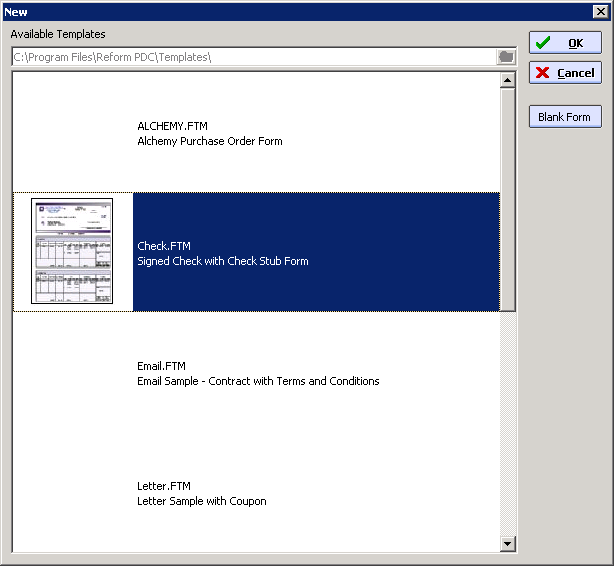 Display different signatures for checks and purchase orders. 4. Display different company logos for multi company systems. 1. In the VDP Designer >> Special Fields >> Printer Profile, map the printer profile name on the text layer or define it from the page script. 2. 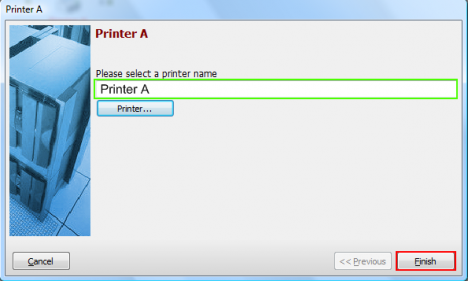 Go to VDP Designer >> File >> Page Setup and select a printer and set all the properties (tray, finishing etc) and select Save Profile and use the same name as the printer profile name in #1. 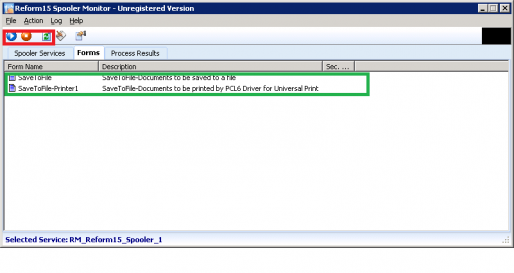 This will allow users to pass a printer name in their data stream that will control the printer and destination. Also, if there is text in the text layer which matches the printer name and there is no other printer profile selected, it will use that printer profile. This section displays the current settings of the selected printer. next to the selected printer. Select either Portrait or Landscape. Note: The Print to and Send to settings are mutually exclusive. Depending on the printing method you choose, selecting one will disable the other. The Start Printing From Page option lets you choose the print start page. The Always Update checkbox, if selected, will automatically push the printer settings to all forms that are linked to the current form through the Form Linking setting in the Form Properties. It will create different print jobs in the printer queue. This setting can include different printer trays, print settings such as duplexing, collating, stapling together multi-part forms, etc. If selected, the form overlay will not be applied to the form at the time of printing. What is the Workflow Designer? Reform’s Workflow Designer is visually enhanced wizard approach to designing and implementing a workflow. It gives users the ability to drag and drop different steps of the workflow process onto a digital canvas which then automatically makes all the changes necessary to the chosen input data in order to satisfy what the user sees on the screen. There are five main types of objects that can be added to the workflow: Arrow Connectors, Comments, Inputs, Processes and Outputs. Arrow connectors are used to link between Inputs, Processes and Outputs and provide the visual logic to a workflow. Comments are used to add descriptions to different parts of the workflow in order to more accurately depict what is being done at each object or group of objects. There are two different types of inputs which depend on which Plug-ins a user currently has installed: "Form and File" and "From MOST". "Form and File" is your typical Reform Form and data stream and is available to all users. 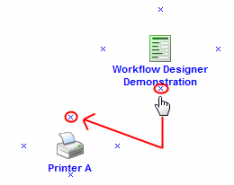 "From MOST" is only available if Reform’s MOST Plug-in is installed and allows the user to configure a workflow around an MFP (Multi Functional Printer). A user is limited to one input per workflow. Processes include DAC (Document Authority Control) and Tag Doc (a bar-coding and document routing system) and are available depending on which Plug-ins a user currently has installed. The DAC Plug-in is required to be able to add the DAC process onto a workflow. 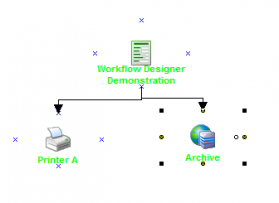 Adding a DAC processes onto the workflow gives the user the ability to route documents based on a hierarchy. The DAC process requires an Input and at least one Output type. The Tag Doc Plug-in is required to have the capability to add the TagDoc process onto a workflow. Adding a Tag Doc process onto the workflow gives the user the ability to add barcodes onto their forms and subsequently decide what to do with those documents once they are scanned. 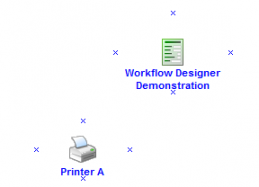 Currently there are 8 different available Outputs depending on which Plug-ins are installed: Printer, SaveToFile, Email, RightFax, Ricoh LanFax, Microsoft’s SharePoint, DocumentMall and Alchemy. Printer and SaveToFile are installed by default with Reform. All other Outputs require their respective Plug-ins. All outputs require at least one Input to be configured but can also be a combination of an Input and any number of processes. For example, one workflow can have a "Form and File" input, and then be routed to DAC. Once approved in DAC, the document can then be sent through the Tag Doc process and printed with a barcode. Finally, the Tag Doc process would be connected to the desired Output. All of the Outputs have intelligent and newly redesigned setup wizards to appropriately configure each respective output and have control over different settings. The settings in each output can be statically entered or can use variable data from the data stream or MOST. Once a workflow is complete, the execute button on the toolbar is clicked in order to fulfill what is represented on the screen. During this process, the form will be backed up to a Workflow Designer Original Forms directory which is located in the same directory as the selected form. Each Process and Output will have their own form which is also created in the same directory as the selected form. All forms will be linked together in the appropriate manner and all form modifications (adding special fields, configuring the send to device, or printer) will take place. Each newly created form is copied from the original backed up form so that the user can easily make additions to the workflow without having to go delete any forms in the forms directory. Every change can be verified by opening up the forms in VDP Designer. 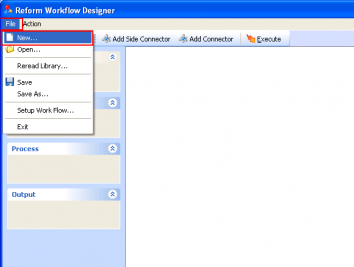 The Workflow Designer improves upon the current way of trying to configure a workflow. Presently, it is very easy to get lost while sending a form to multiple destinations or through different processes. The Workflow Designer simplifies the whole process of trying to recreate a workflow which could have been originally been drawn with pen and paper. The user has control over different Processes and Outputs through the use of either static or variable data. With the Workflow Designer, you now have a visual representation of your workflow which can be easily modified by adding, removing or reconfiguring different Processes and/or Outputs. Have the ability to save a workflow and then later go back and make changes without having to configure parameters all over again. This tutorial will walk you through the steps of creating a simple workflow in Reform. It will demonstrate how to setup Reform to print a document, while at the same time archiving the file to your hard drive. The workflow will be created using the Workflow Designer. First, start the VDP Designer. We will be creating a new form with an existing template. Go to File > New > New. Select the SaveToFile template (for demonstration purposes) and click OK.
1. When it asks if you would like to open a text file for designing, select No. 3. You can now close the VDP Designer since we have our form which will be used to configure and route the document. Now that we have our form, we can begin to fulfill the desired workflow using the Workflow Designer. First, start the Workflow Designer. 5. 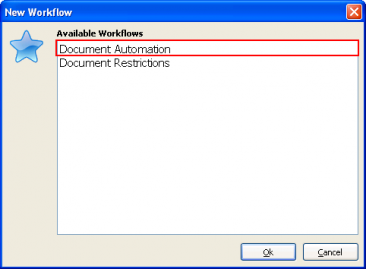 Select "Document Automation" and click Ok.
*Note: You will now notice that the available Workflows, have been populated by the various Plug-ins you have installed. 6. First, drag and drop a Form and File object onto the workflow by clicking and holding your mouse on Form and File and then moving your mouse over to the workflow and releasing the mouse button. 7. Enter a description for the object you just added. This is done by typing in the provided box. Type "Workflow Designer Demonstration" and click Finish. 9. 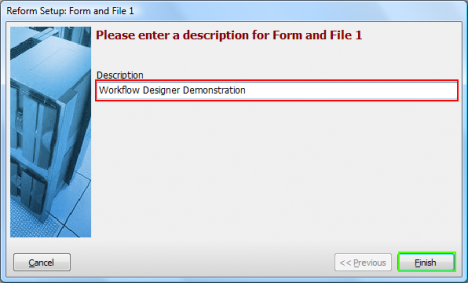 Now we are ready to configure the "Workflow Designer Demonstration" form and input file. To do so, right click on the newly added object and select "Configuration…" or simply double-click on it. 10. You are now presented with the Input Setup window. First, we want to select the TextFile or data stream that our form will be using. To do so, you can simply begin typing in the box, or you can browse to find it. We are interested in the SaveToFile.out file. Click the small folder icon to bring up a window which will let us choose that file. Select the file and click Open. 11. After choosing the text file, you are taken back to the Input Setup page so that you can now select a form. 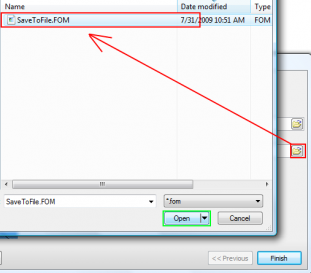 Click the small folder icon to bring up a window which will let us choose the desired SaveToFile.FOM form file. Select the FOM file and click Open. 12. Now that you have both your Input Text File and Reform Form selected, the setup of "Form and File" is complete. You can quickly double check that the correct files are selected and then click Finish. 13. You will also be prompted to add a page-break field to the forms. At this point, we want to select Yes and select InvoiceNo from the list. Once configured, the "Workflow Designer Demonstration" text should have changed to a blue color signifying that setup has been run. Now your Input object is ready for an Output. 14. Next we want to add a printer to our workflow. We use the same drag and drop procedure as with the Form and File (see step 7). 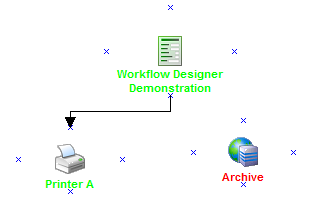 Take your mouse and drag the "Printer" object from under Outputs onto the workflow somewhere below your Input. Once you release your mouse, you will be prompted to describe "Printer". Type "Printer A" in the box and then click Finish. *Once you click Finish, you are taken back to your workflow. Your Printer will have a Red Caption because it is not yet configured. 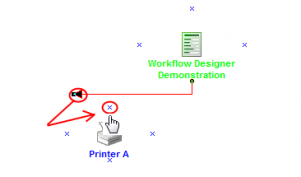 You can configure a Printer without making a connection with an Input or Process, whereas other outputs need to be connected before configuring them. 15. We will now configure "Printer A". 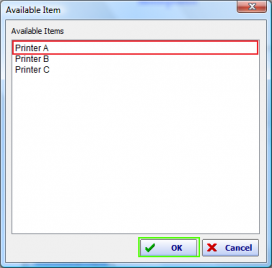 Double click on the "Printer A" object to launch the setup screen. You can also right-click and select "Configuration". 16. To select a printer, click the "Printer…" button. A list of printers will be available. 17. Select your desired Printer. For the demonstration, we selected "Printer A". You may select any available printer. After you have your selection, click the "OK" button. 18. You are now taken back to your "Printer A" Setup dialog. You can confirm your selection in the box. If you need to make a change, simply hit the "Printer…" button once again. When verified, click Finish. *This takes you back to your workflow. You can now see that the "Printer A" caption is blue since it has been configured. 19. 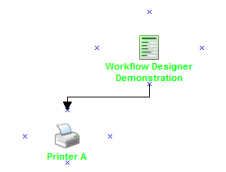 Now we are ready to connect the Input: "Workflow Designer Demonstration" to the Output: "Printer A". We need to choose either a Connector or a Side Connector; either can be used to connect the two. We will use a Side Connector. To use a connector on the screen, you first need to select it. To select, use your mouse to click the appropriate button in the menu bar on top. 20. 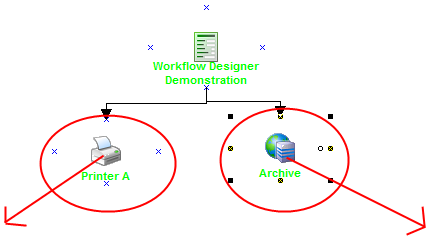 After you click "Add Side Connector", you are ready to make the link between your two objects, "Printer A" and the "Workflow Designer Demonstration". 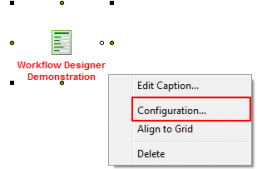 To do so, point your mouse at the small x right below "Workflow Designer Demonstration" and your mouse pointer will turn into a small hand as seen below. Once you see the hand, click and drag the mouse pointer to the small x right above the Printer object and your mouse pointer will once again turn into a hand icon. At that point, you will see a preview of the connector that is being made and you can release your mouse button. Don’t worry if you missed either end of the connector, you can always move it around. *If done correctly, both the captions will turn green as seen below. You can skip to step 19. *If done incorrectly, you might get something like below. As you can see, the Printer caption does not turn green. You can still drag the end of the connector into "Printer A". This is done by dragging the end of the arrow to the small x above the Printer. When you see the small hand icon, release your mouse button. Both are green again. * To delete an arrow or object from the form, you can use the Red X in the menu bar or right click on it and select Delete. 21. Now that our first connection is complete, our next task is to add a "SaveToFile" output onto our workflow. First we need to drag the "SaveToFile" object onto our workflow. This is done the same way as step 7. Click and hold your mouse over "SaveToFile" and drag it somewhere to the right of "Printer A". 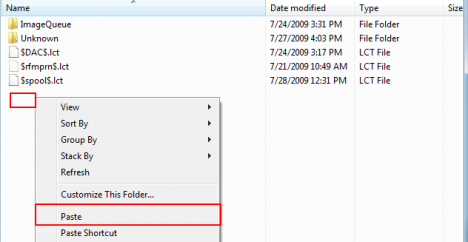 Once you release your mouse button, you will be prompted to describe the "SaveToFile" output. Type "Archive" in the box and click Finish. *Once you click Finish, your workflow should look similar to below. You will notice a red caption for "Archive" because it is not yet configured. 22. We need to configure "Archive". 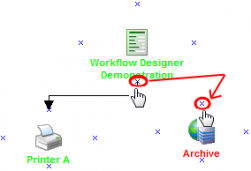 To do so, we first must make a connection between "Workflow Designer Demonstration" and "Archive". First choose "Add Side Connector" from the menu bar as in step 17. 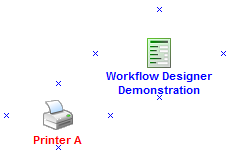 Next, put your mouse over the small x below "Workflow Designer Demonstration" and you will notice a small hand icon. Then click and drag your mouse pointer to the small x on top of "Archive". You will once again notice a small hand icon and you can release your mouse. *If you do not make the connection on the first try, do not worry. Follow the second asterisk in step 18 to correct this. 23. If done correctly, you will be presented with a dialog box upon completing the connection. Click Yes to configure the Output you just connected. 25. The setup wizard will now walk you through the configuration of your SaveToFile output. The first piece of information is the Root Folder. You should create a folder called demo on your C:\ drive for demonstration purposes (You can select a different directory if you prefer). Next, click Browse and navigate to your newly created folder: C:\demo. Click OK once selected. If a directory was available in your data stream, you would be able to use that as well. In our case, one is not available. *After selecting the demo folder, your dialog should look like below. Verify the path in the box and click Next. 26. The next piece of information the wizard needs is the folder structure. Your root folder is C:\demo\. You can make subfolders in the demo either from static data (which you type in) or from variable data (available in the data stream). By default, you first have the option to enter static data. If you want to select variable data, you need to click the "Click here to select variable information" button. 27. 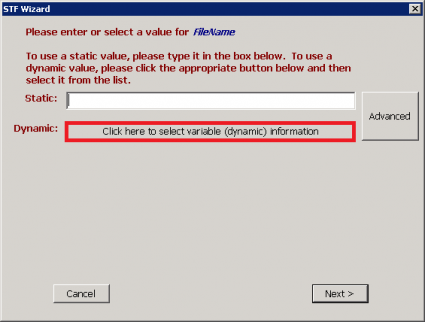 After clicking the above button, you will be presented with a new dialog which lets you select variable data, this variable information has already be defined using the VDP Designer. You can also go back to static data by clicking the appropriate button, but for the demonstration we want to choose variable data. We want Folder 1 to be the AccountType so we select this from the list. Once selected, click Next. 28. For our demonstration, we do not want to make any more subfolders, so click Stop Looping at the next dialog. 29. The next piece of information needed by the wizard is the filename. Once again we want this to be variable data from the data stream so we want to click the "Click here to select variable information" button at the following dialog. 30. Once clicked, you will be presented with a new dialog which allows you to select variable data. We want FileName to be InvoiceNo. Scroll down until you find this variable. Select the variable InvoiceNo and click Next. 31. The next screen will ask you to enter the value of the meta data to be stored in a file. For this, we would like to skip this field. To do so, click the "Skip" button. 32. 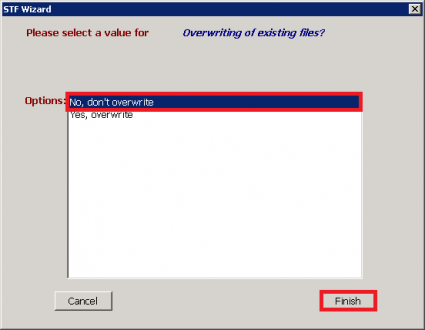 The next screen will ask you to select a value for overwriting of existing files. Select an option than click Finish. 33. You have completed the configuration wizard for SaveToFile output "Archive". Your workflow should look something like below. Notice that the "Archive" caption is now green like the others. 34. You can move around the objects on the workflow so your screen isn’t as cluttered. To do so, simply click and hold your mouse over the objects and drag them to other portions of the screen. Your connectors will move along with the objects preserving the connections. 35. Since we are now complete, first thing we should do is author our project and save it. We will do this for the demonstration, but you simply could have skipped this and went to the execution stage. First, you should author the project. Go to File > Setup Workflow. 36. We are asked for the "Workflow Name" and "Prepared By". 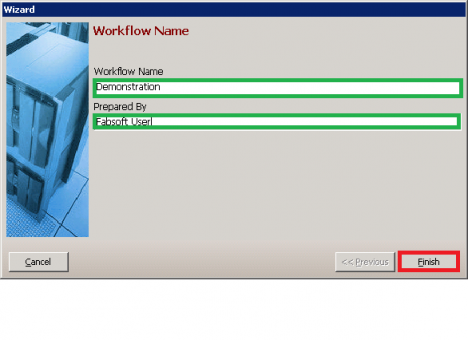 Type "Demonstration" for "Workflow Name" and "FabSoft User" for "Prepared By". Verify that your descriptions are correct and click Finish. 37. Now we will save the workflow so we can come back later to access it and make any needed changes. To do so, go to File > Save. 38. You may save your workflow file anywhere. For simplicity, we will save it in the Workflow folder of your default Workflow-Designer directory. The path should be C:\Program Files\Reform…\Plug-ins\Workflow-Designer\. Save it as demo. *You will notice that the filename will appear at the bottom left corner of the Workflow Designer. 39. Your workflow is now ready to be Executed. To do so, click the Execute button in the above menu bar. 40. Execution speed will depend on each system but it should be fairly quick. Once complete, you will get a message box which displays what has taken place. Click OK once finished. 1) Your SaveToFile.FOM has been modified. This form now has all the properties needed to send your data to "Printer A". 2) There is a new file called SaveToFile-STF1.FOM. This is the form which has all the properties to save your file to the folder location. There is also a form link specified in SaveToFile.FOM that links SaveToFile.FOM to SaveToFile-STF1.FOM so that both processes are carried out. This is the form used throughout the form creation process so that each output device has a clean slate. If any changes need to be made to subsequent forms, they should be made to this original form as it is used as a template in the form creation process. Any changes made to this original form will be reflected the next time the workflow is executed. Another approach is to "cut" this file to your forms directory and rename it to SaveToFile.FOM overwriting any previous file. 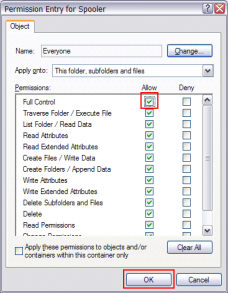 Then changes can be made to this form and it will be backed up in the same folder upon the next execution. *Changes can be verified by opening each form in VDP Designer and viewing the properties and page setup. 42. We want to send the sample data through our workflow now to verify the results. The Spooler Application should now be started. Once it is open, press the Start button. It should now say Start in the lower left corner of the Spooler window. If the Spooler was already running and started, it will need to be refreshed so that it recognizes the new forms that we just created with the wizard. The safest bet is to stop the spooler, refresh it and then start it again. Verify that your forms are listed after this procedure. 43. Once the spooler has the correct forms, we can simulate a data stream by queuing up a file in the Spooler directory. This directory is usually located at: C:\Program Files\Reform…\Spooler\. 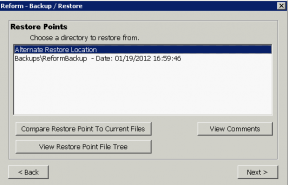 Navigate to your Backups location where your SaveToFile.out file is located (C:\Program Files\Reform…\Backups\). Find the SaveToFile.out file and right-click on it and select Copy. 44. Next we want to paste that file in the spooler directory. Navigate to the Spooler directory. Right click in the white space and then select Paste. 45. When the Spooler Application begins processing the file, you will notice the file name change to something similar to the image below. It shows that the file is being processed by the SaveTofile form. 46. Our output (2 pages) should be in two locations: at the printer we had selected and a PDF in the directory we selected before (C:\demo\). Navigate to the C:\demo\ folder. You will see the folder named RES because that is the subfolder structure we chose (AccountType was the variable). If you do not see the desired output, please make sure the service account for the Reform Spooler has enough permission to the selected directory. Please see the Reform Spooler section of this manual on how change the logon account. 47. Double click on RES and then you will see your 2 page PDF file. If we had turned on page-breaking in one of the previous prompts, and selected the InvoiceNo variable, then we would have ended up with 2 one-paged PDF files. Same would be the case with the Printer (queue would have been broken up into 2). Confirm the contents of this file by opening it and examining the data. 48. Below is the PDF file that Reform has generated. At the same time, a page should print to the printer you selected in the wizard. 49. Once the document is printed, and appears in the directory you selected, the demonstration is over. You can re-print the document by copying the file from the backup directory to the spooler directory again. You can also create another new form and run through the Workflow Designer again. 'The Designer should never 'be used through terminal services (such as Windows Remote Desktop) or through a Citrix environment. The Decision Maker section presumes that you have an understanding of form overlay design. If you have not yet learned how to create and configure a form overlay, you must first learn how to use VDP Designer to design form overlays. This information can be found in the VDP Designer and Output Devices sections of this user manual. Decision Maker is a powerful tool used to give you more flexibility and control over the output of a print-job based on information contained in the Information produced by your system. Using Decision Maker, it is possible to direct Reform to use different form overlays each time the Spooler encounters the same information file; this is done by supplying it with logical conditions and telling it what to do if the contents of the print-stream meet those conditions. Because of the open-endedness of the configuration process that goes into using Decision Maker, the complexity of the logical conditions that you supply it with is limitless, as are the destinations and configurations of your final output. For Decision Maker to work, an intermediary form overlay must be created. This form overlay reads the contents of the print-stream and sends it to a script file that it pulls from the Reform…\SendToScripts\ directory. The script file contains the logical conditions and commands that manipulate the information in the text file. The information is then manipulated according to the instructions in the script file, resulting in any number of possible outcomes. The most popular use of Decision Maker makes use of the ability to turn one print-stream into many ASCII/Text files of different names and write them back into the Reform…\Spooler\ directory to be paired with form overlays that match the names of the new files. This allows for a more dynamic output process than the use of Form Link. 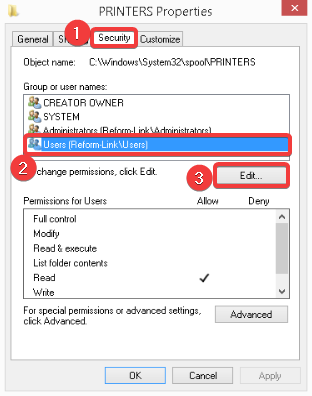 Form Link provides you with a static method of routing documents to different output devices that can only be changed by altering the form overlay’s settings in VDP Designer. Decision Maker, on the other hand, allows you to create a number of forms that might or might not be used depending on conditions that you define during the design process. In this way, you don’t have to manually change settings in a form overlay, and any number of form overlays may be used at any time, in any order. To clarify, let’s assume that your system sends a single file to the Spooler directory that contains a large number of purchase orders, and you want Decision Maker to determine the least expensive method of distributing them. The Decision Maker script contains instructions to analyze the text file and search it for an email address. If it doesn’t find an email address, you’ve instructed it to look for a fax number. If it finds neither of those, then you’ve instructed it to print the purchase order in your mail room to be mailed to your vendor. A more detailed example is as follows: Suppose your system generates an ASCII/Text file called "PurchaseOrders.out". When the file appears in the Spooler directory, the Spooler matches it with a form overlay called "PurchaseOrders.FOM"; this form overlay sends the information from the file into the Decision Maker script file, which searches the first purchase order for an email address. If it finds an email address for the first purchase order, it extracts all pages associated with that order and sends them back to the Spooler directory as a new file called "PurchaseOrderEmail.001". This new ASCII/Text file is matched with a form overlay of the same name(PurchaseOrderEmail.FOM), which has been configured to send it out via email. Decision Maker then continues for each consecutive order that it encounters in the text file and processes them individually, according to the same set of rules, generating new ASCII/Text files called "PurchaseOrderFax.001" or "PurchaseOrderPrint.001" if the necessary conditions are met. If it needs to generate many text files of the same name, it simply increments the file extension each time, generating files with extensions ’.002’, ’.003’ and so on. In the hypothetical situation above, a limitless amount of purchase orders can be sent to as many customers as necessary, and Decision Maker will always make sure they go out via the least expensive distribution method. This minimizes the cost of sending the purchase orders, as well as the labor normally associated with their allocation, while maintaining a centralized system of control over their distribution. Decision Maker makes use of FabSoft’s ShortCut technology. Some previous programming knowledge is required to write ShortCut scripts, and it is recommended that you have at least a rudimentary understanding of basic programming. You can use the sample script file provided by FabSoft as a template by which to configure Decision Maker for your purposes. The provided sample script is easy to understand for somebody with a basic understanding of programming fundamentals. FabSoft’s trained Professional Service Consultants can also help you in creating scripts designed to meet your specific needs. There are three steps to using Decision Maker. First, an intermediate form overlay must be created and set to call the Decision Maker script. Second, a script file must be created containing the logic necessary to manipulate the information received from the intermediate form overlay. Finally, all static form overlays associated with your needs must be created and configured to send to the right devices (these are regular Reform form overlays). A Decision Maker form overlay contains no graphical formatting, but only special fields like Email-To, Fax, other custom fields, or page break fields which are mapped to the text layer to gather data from it. This is because this form overlay is not the final destination of the information in the associated text file, and is merely an intermediate step that sends the information to Decision Maker for logical destination routing. It also has a Decision Maker Send-To-Script as described in the previous section as the Send-To-Device. The following information contains samples of ShortCut script code and uses language associated with basic programming. It is recommended that you have a basic understanding of programming syntax and terminology in order to fully understand this section. All potentially confusing programming terminology employed in this section can be found in the glossary located at the back of this user manual. Please refer to the glossary if you find a term that you are not familiar with. Open the DecisionMaker.fbs file, located in the Reform…\SendToScripts\ directory, in your ShortCut Script Editor (In the VDP Designer, go to Options>Show Script Debugger and then File>Open). Note the multicolored text- the red text signifies comments, and has no effect on the functionality of the script. You can place as many comments as you want in a script file without fear of causing any problems. It is recommended that you use comments to make notes for yourself in the script while learning how to use the script. In the following pages, we will analyze the Decision Maker script. Remember, if you encounter terminology that you are unfamiliar with, please refer to the glossary. The following is an overview of the commands, syntax and functionality of the script. 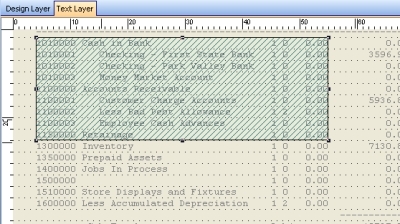 The table below explores the script in the DecisionMaker.fbs script file line by line. The script is displayed in the gray areas, followed by a summary of what it does and how to use it in the white areas. You do not need to worry about making alterations to these lines. These lines store the Spooler directory path in a variable called SpoolerDirectory. This line declares a variable called FormName and stores the name of the form overlay in the variable using the GetFormName() function. The Upper command causes the information to be stored in uppercase. These lines tell the program what to do if the information contained in the FormName variable equals "PURCHASEORDER". In basic English syntax, we are telling the program, "In a case where the form name is "PURCHASEORDER", execute the commands contained in the PurchaseOrderProcess subroutine." This line tells the program to stop. You may be confused by its location, as it is not located at the end of the file. This can be misleading; the reason for its location is quite simple. In the Caseof block above, the Gosub command tells the program to execute the code in the PurchaseOrderProcess subroutine. After the commands in the PurchaseOrderProcess subroutine are executed, the program then Returns control to the Gosub command and continues executing from that point. It then reaches the End statement, and the program stops. By the time the End command is reached, all code above and below it has been executed. ’Put the case in order you want them to be process, example Email will be process before Fax. Case Trim(_EmailTo) <> "" and Trim(_EmailTo) <> "empty@emailaddress.com"
Case Trim(_FaxNumber) <> "" and Trim(_FaxNumber) <> "EMPTY"
This is the PurchaseOrderProcess subroutine referenced in the "Caseof" block above the End command. Everything contained between the lines "PurchaseOrderProcess:" and "Return" constitutes the commands that are executed when the subroutine is called. This subroutine contains a block of code that tells the program, in basic English syntax, "In cases where the EmailTo field in the DecisionMakerPO.FOM form overlay is not empty and does not contain the string "empty@emailaddress.com", append "Email" to the end of FormName and send it to the CreateSpoolerFile subroutine. If the EmailTo field is empty but the FaxNumber field is not (or contains the string "EMPTY", append "Fax" to the end of FormName and send it to the CreateSpoolerFile subroutine. Otherwise, append "Printer" to the end of FormName and send it to the CreateSpoolerFile subroutine." The commands between the first and last lines of this block cause the new text file to be created and returned to the Spooler directory for processing. For our purposes, only the first and last lines of the Sub block need to be examined. The name of this Subroutine is CreateSpoolerFile, and it receives information from the command that called it. The information it receives is contained between the parentheses. In section 5, the command CreateSpoolerFile(FormName + "Email") appended the word ’Email’ to the end of the form name and sent it to the CreateSpoolerFile subroutine. SpoolerFileName represents the received information. This is how the program knows what to call the file it places in the Spooler directory for processing. All references to Special Fields or Label Objects that you use to map information for use in a Decision Maker script must be notated in the code with an underscore followed by the object name. For instance, in the sample form overlay there is an object called ’DMFormName’; in the Decision Maker script file, it is notated as ’_DMFormName’. Decision Maker only reads code written in the ShortCut scripting language. Make sure that your code employs the proper ShortCut syntax. You may add as many lines as you want to the DecisionMaker.fbs file, and create logic for the use of many different intermediate form overlays by simply creating different subroutines for different form names. Alternately, you may save separate script files with different names and reference them as the Send-To-Device in your intermediate form overlays. To do so, you must make alterations to the Send-To-Devices in the registry. Please see Adding Your Own Send-to-Device section. Having reached the end of this chapter, you should now have an understanding of the power and flexibility that you can achieve over your printed forms and their destinations through the use of Decision Maker. Decision Maker is capable of much more than we’ve had the opportunity to discuss within these pages; with a complete understanding of the ShortCut scripting language and the use of Decision Maker, the possibilities are endless. The time, labor and money saving benefits of using Decision Maker can be enormous. If you have any questions or comments regarding its use, we would be happy to hear from you. Feel free to call our Customer Service department at any time, and one of our trained professionals will be glad to hear your suggestions or answer any questions you may have. Page Process Scripts are designed to visually alter the Design Layer before the form is printed. The script runs once for each page. For example, if a DataStream contains 10 pages the Page Script will run 10 times. To add or edit Page Scripting open VDP Designer >> File >> Form Properties >>Page-Process Script. 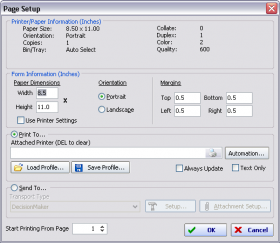 _PrinterProfile – can be used to change printer and printer setting. See section on Printer Profile. After a form is finished or if break fields are being used, the device script will get executed. For example if you are faxing 1000 page document and sectioning is being used and each page is for a different recipient the device script will get executed 1000 times. If sectioning is not being used the device script will only be executed once. Decision Maker is another powerful use of a device script. _JobStart – Contains the page # of the start of a section. _JobEnd – Contains the page # of the end of the section. _TextPage[<Page Number>] – The text content of the page, example _TextPage would return the forth page of text. _PageTotal – Contains the total # of pages in entire document. In the above example _PageTotal would equal 1000. _PrinterTitle – Controls the name of the print job. For example _PrinterTitle="Invoice No. :52023666A BOL#:05209673001" would yield a print job title of "Invoice No. :52023666A BOL#:05209673001". The title of the print job will be displayed in the printer window. _ObjectName[<Page Number>] for example _TotalAmount would return the contents of the TotalAmount object on the fifth page. For device scripts, if using an object that exists in the text layer, the special "Track Value" property should be turned on. To do so, select the object to display its attributes under Properties. Look for the "Track Value" option and change it to True. _ObjectName an example _IPAddress would return the contents of the IPAddress in the Design Layer. You will see a list of currently installed Send-To-Devices available in Reform. To add your own device, simply right-click in the whitespace below all the devices and select New>String Value. Name your device something meaningful, i.e. MyDevice1. You will also notice that some devices have a value of 0 and others have the same value as their key name. 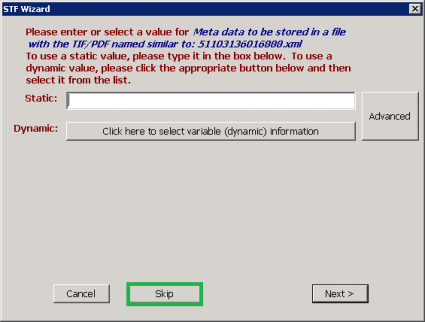 Enter the device name as the value if your device needs to produce a PDF or TIF file upon execution, otherwise enter 0. Two good examples are DecisionMaker and SaveToFile. Since Decision maker does not require an output file, it has a value of 0. SaveToFile, on the other hand, needs to create a TIF or PDF when it is processed so it can be saved. Depending on what you are going to be doing with your new MyDevice1 send-to-device, double click on the key you just created and type in a value – either 0 or MyDevice1. If you set the registry value to the device name, an image (the type is specified in attachment setup) will be created in the \Reform…\Queue directory for use inside your custom script. It is automatically deleted (cleaned up) once the script executes. If you have VDP Designer open, close it and open it back up. Go to File>Page Setup. Select SendTo… and your newly created device will be available. You can also click the Attachment Setup button to specify the image type. This command will call other script and resume upon finish. PRINT "Back from called script"
PRINT "Timeout Waiting for text!" Executes the first statement block after CASEOF and before ENDCASE whose associated conditional statement evaluates to true. CASE is used to execute a set of script commands based on the result of a logical condition. When CASEOF is executed, successive logical cases are evaluated; the results of the evaluations determine which set of commands is executed. When the first met-condition CASE clause is encountered, the statements following it are executed. Execution of the statements continues until the next CASE or ENDCASE is reached. Execution then resumes with the first command following ENDCASE. If a CASE clause does not meet the condition, the statements following it up to the next CASE clause are ignored. One and only one CASE clause is executed - the first true CASE clause. Any succeeding true CASE clauses are ignored. If OTHERWISE is omitted, execution skips to the first command following ENDCASE. Comments can be placed after CASEOF and ENDCASE on the same line. The comments are ignored during program compilation and execution. PRINT "You are less than 20"
PRINT "You are between 20 and 40"
PRINT "You are between 41 and 60"
PRINT "You are between 61 and 80." PRINT "You are over 80 years old." A string formatted similar to a Dialog script. This is mostly used for generating dialogs dynamically. Signifies the end of the script. You can END the script at anywhere within your script. If there are subroutines in your script, make sure that the END command is include right before all the subroutine codes. This way the script will not try to execute those subroutines unintentionally. message = "Too many tries"
This command will execute other application and resume the next script line without waiting for the application to finish. Executes the commands after FOR and before ENDFOR a specified number of times. FOR.. ENDFOR executes a set of statements within a loop a specified number of times. A variable is used as a counter to specify how many times the statements inside the loop are executed. Program statements after FOR are executed until ENDFOR is reached. The counter <variable> is then The counter is always incremented by 1. The counter is then compared with the final value <begin value>. If the counter is less than or equal to the final value <begin value>, the statements following the FOR clause are executed again. If the counter is greater than the final value <begin value>, program execution branches outside the FOR ... ENDFOR loop and continues with the first command following ENDFOR. 1. The values of <variable>, <begin value> and <end value> are read initially only. However, changing the value of the counter <variable> inside the loop affects the number of times the loop is executed. 2. Do not use GOTO to exit out of FOR.. ENDFOR loop, this may cause unexpected program execution. Use EXITFOR the exit out of FOR.. ENDFOR instead. FUNC <function name> is a statement within a script file. It specifies the beginning of each function in a script file and defines the function name and parameters. Function names must begin with a letter or underscore and may contain any combination of letters, numbers and underscores. The FUNC <function name> command line is followed by a series of commands that make up the function. You must include ENDFUNC as the last line of a function. The difference between FUNC and SUB is that FUNC can return a value, but, SUB cannot. The result of a function is passed back by assigning RESULT with a value. To use a function, simply include the function name followed by its parameters into your codes (see example). Advance users may want to pass a parameter by reference. Passing by reference allows a function to modify the value of the parameter. To pass a parameter by reference, prefix the parameter name with &. 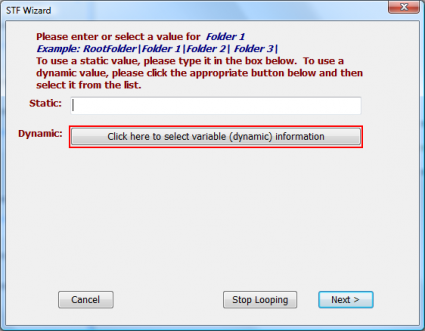 Set the specified variable as global to make it visible throughout the program. Normally all variables are declared as private. As a result, they can only be seen by the program blocks they belong to. Keeping the variables private prevents overwriting the content of variables unintentionally. By declaring a variable as global, any blocks of codes can access the variable. Therefore, use global only if necessary to reduce programming errors. Example 1: This example demonstrates how a private variable behaves. Example 2: This example demonstrates how a public variable behaves. Skip to the specified Label Name. PRINT "Cannot find Untitled - notepad"
You should not use GOTO to get out of a FOR..ENDFOR loop. ’-- Do not do this!!!!!!!! Conditionally executes a set of commands based on the outcome of a logical expression. In this structured programming command, the <condition> is evaluated. If <condition> evaluates to true, any statements following IF and prior to ELSE or ENDIF (whichever occurs first) are executed. If <condition> is false and ELSE is included, any statements after ELSE and before ENDIF are executed. If <condition> is false and ELSE isn’t included, all statements between IF and ENDIF are ignored. In this case, script execution continues with the first command following ENDIF. You can nest an IF ... ENDIF block within another IF ... ENDIF block. ’-- Find out if you are older, younger or the same. ’-- and display the appropriate message. INCLUDE allows you to use subroutines or functions from an external script file. All the subroutines/functions that are used often should be grouped together in a script file. This way you can always have an access to those subroutines or functions just by using INCLUDE command. You can use as many INCLUDEs as needed. When you execute a subroutine or a function, ShortCut searches the files specified by INCLUDE command if the subroutine or function isn’t located in the currently executing script file. Prompt the user for an answer. The answer will be stored in the specified variable. Note that the variable name must not contain any white spaces. Appending ", 1" at the end of a pause statement uses a second method of pausing. In some environments the PAUSE command may not work if another software application modifies the systems clock. This method uses a different approach to pause the script and may help in this situation. PRINT evaluate expressions and popup a window with the results. This is useful for notifying the user for an attention. Note that you can cascade the message with a combination of text and variables by using +. Keep in mind that if a script is set to run as a service, Print statements will not prompt the user but will be written in the event log. PROMPT evaluate expressions and popup a window with the results for the specified number of seconds. This is useful for notifying the user for an attention. Note that you can cascade the message with a combination of text and variables by using +. ’-- and wait 10 seconds for a respond from the user. Keep in mind that if a script is set to run as a service, Prompt statements will be ignored. Returns the script control to a where the GOSUB was called. SUB <subroutine name> is a statement within a script file. It specifies the beginning of each subroutine in a script file and defines the subroutine name and parameters. Subroutine names must begin with a letter or underscore and may contain any combination of letters, numbers and underscores. The SUB <subroutine name> command line is followed by a series of commands that make up the subroutine. You must include ENDSUB as the last line of a subroutine. The difference between FUNC and SUB is that FUNC can return a value, but, SUB cannot. To use a subroutine, simply include the subroutine name followed by its parameters into your codes (see example). Advance users may want to pass a parameter by reference. To pass a parameter by reference, prefix the parameter name with &. Conditionally loops through a set of commands based on the outcome of a logical expression. In this structured programming command, the <condition> is evaluated. If <condition> evaluates to true, any statements following WHILE and prior to ENDWHILE are executed. If <condition> is false, all statements between WHILE and ENDWHILE are ignored. In this case, script execution continues with the first command following ENDWHILE. Converts a character to an ASCII value. 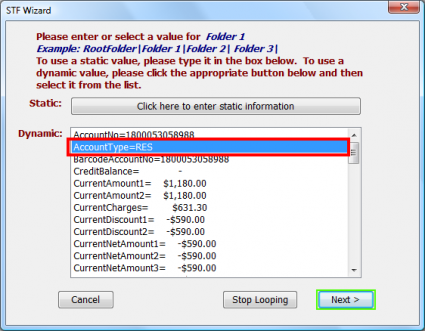 This function is useful for month-closing automation for your accounting application. BOM() returns the beginning date of the current month. EOM() returns the ending date of the current month. Change the current directory to specified <directory>. PRINT "CHDIR is executeted successfully"
This function will read in a variable or a file and break up each line of the CSV file into on page per each line and each field will be placed on it own line. Returns the location of the specific directory. By default, Shortcut runs the script verbose mode. When there is an error, Shortcut will popup a window with an error message. By specifying an error log file, Shortcut automatically runs in a silent mode. Instead of popping up a mesage when there is an error, Shortcut silently records the error to the log file. This is useful for running an unattended script. If you would like to turn off the logging (and run in verbose mode) in a middle of the script, you can do this by passing an empty string ("") to ERRORLOG function (example: ERRORLOG("")). Use EXITFOR to break out of FOR...ENDFOR loop. Use EXITWHILE to break out of WHILE...ENDWHILE loop. FEEDBACK() reports the confirmation status from INPUT, PRINT or PROMPT command. Include this function immediately after INPUT, PRINT or PROMPT. The value returned from FEEDBACK() reflects the value of the most recent INPUT, PRINT or PROMPT command. 1 if user presses Ok to exit out of INPUT, PRINT, PROMPT commands. ’-- Tell the script to continue even when Cancel button is pressed from PRINT command. Establish a connection to an FTP server. Disconnect from an FTP server. FTPEXEC provide a way to interact with an FTP server. There are many different commands that you can execute. <file 1> and <file 2> may or may not need, depending on what ftp commands you are executing. This function also returns different result depending on the command executed. "local" Specify the target directory on your computer. <param 1> specifies the local directory. This is necessary for download and upload files to the server. "remote" Specify the target directory on the server. <param 1> specifies the remote directory. This is necessary for download and upload files to the server. "get" Retrieve/Download a file (or files) from the Server. <param 1> specifies a file to download. Wildcards are allowed for downloading a group of similar-name files. Example: "text.txt" or "text*.txt"
"delete" Delete a file from the server. <param 1> specifies the file to be deleted. "put" Send/Upload a file (or files) from the Server. <param 1> specifies a file to upload. Wildcards are allowed for uploading a group of similar-name files. Example: "text.txt" or "text*.txt"
"mkdir" Make a directory on the server. <param 1> specifies the directory name to create. "rmdir" Remove a directory from the server. <param 1> specifies the directory name to remove. "rename" Rename a file. <param 1> specifies the old name. <param 2> specifies the new name. "find" Find a file or group of similar-name files. <param 1> specifies the file to find. Wildcards are allowed for finding a group of similar-name files. Example: "text.txt" or "text*.txt". Once the command is executed, you can retrieve the find result by using "found" command. 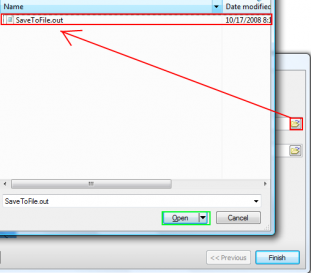 The function returns number of found files which can be used for iterate through the found files. "found" Retrieve the files found as a result of "find" command. <param 1> specifies the file index to retrieve. 1 = first file. 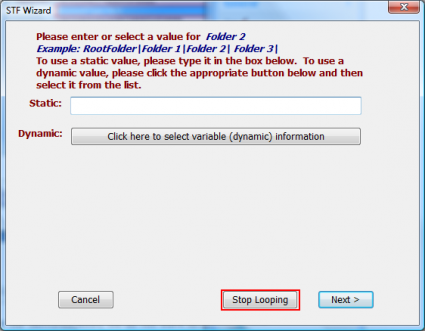 Popup a directory selection dialog box for user to choose a directory. [path/directory] is optional. If [path/directory] is not included, it defaults to the current directory. [path] optional parameter that specifies the default path. Retrieves the form name that Lanier PDC currently processing. This function is useful when a script is used by multiple forms. The script can take different actions based on the form that is currently being processed. 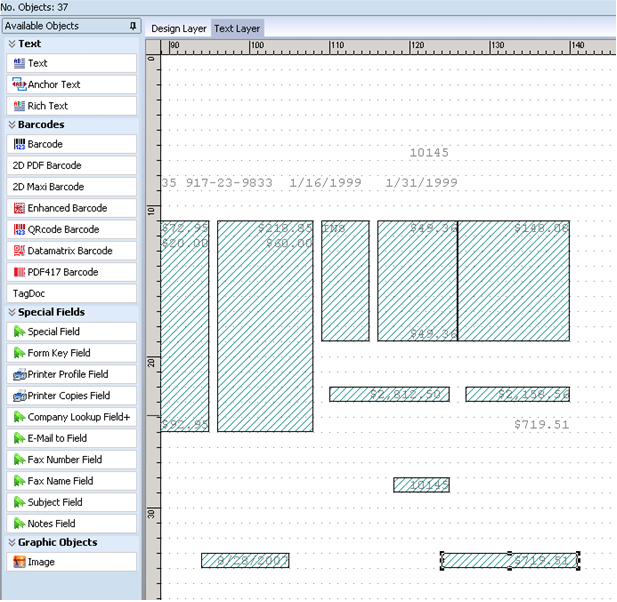 HIDEFIELD and SHOWFIELD are used to hide or show a Lanier PDC Objects on the Design Layer. Each Lanier PDC Object name must be preceed with an underscore symbol ("_"). This is the distince a Lanier PDC object from a regular variable. Retrieve information about the printer. Get the printer status whether it is online, offline, error, etc. Retrieve the directory where Reform is executed from. The returned value will always contain \ at the end. Load variables from file that is created with SAVEVARS. It allows you to load selected group of variables. See About Spec. This function is useful for loading / saving settings for later use. [spec] optional parameter for qualifying variables (example: "gUSR_"). Spec is not case sensitive. It is used for qualifying variables. Only qualify variables that the leftmost part of the name matches the spec will be loaded. ’-- only save the variables that begin with "gUSR"
Sends the queue file to specified host to a specific queue. The function will return True if it is sent successfully and false if there is an error. <destination> is the destination window title you want to send the macro to. However, you don’t need to include <destination> if you want to send the keystrokes to the [file://E:\../../michaell2011/Desktop/Shortcut_Scripting/current_destination_window.htm current destination window] previously set by [file://E:\../../michaell2011/Desktop/Shortcut_Scripting/focus.htm FOCUS] command. Hello |Name|, how are you? Create a new directory/folder specified by <directory>. PRINT "Error creating the directory"
<option> 0 = display error notification and halt the script. 1 = ignore error notification and continue. Retrieve the current Operation System type. This function can retrieve information about your form and the current print stream. **NOTE** This function will only work correctly if it is used in a Page-Process script! "PAGENO" – this will retrieve the current page number of the print stream that Reform is processing. "PAGES" – this will retrieve the total number of pages in the print stream. "Spoolfile" – this will retrieve the filename of the current print stream that Reform is processing. "Totalpages" – this will retrieve the total number of pages in the print stream. "Formname" – this will retrieve the filename of the form that is open. "Currentpage" – this will retrieve the text of the current page. "Spooler" – this will retrieve the path to the Spooler folder. RESULT is used exclusively within a function. It’s a special variable that is used to return a value from a function. <number> number to round up. SAVEFORMVARS saves the entire content of Reform Fields to a File. This function provides an easy way to memorize the content for later retrieval using LOADFORMVARS. [Optional_FileName] = Specifies the file name to save to. If left blank, the Form Name with an extension ".mem" will be used. Save specific variables to a file that can later be loaded using LOADVARS. It allows you to save selected group of variables. See About Spec. This function is useful for loading / saving settings for later use. Spec is not case sensitive. It is used for qualifying variables. Only qualify variables that the leftmost part of the name matches the spec will be saved. Set various properties of the created PDF document. This function only works within a Page-Process Script. This will override the settings set via attachment setup. (True/False) embed the font into the PDF document. (True/False) Explicitly turn on the encryption. It will initially turn off the "printing", "changing", "copying", and "form" flags. You must explicitly turn these options on. Can be a string or True/False depending on the specified property. ’-- The PDF can not be opened unless the user has the user password. ’-- encrypt is automatically True because we set a user password. Disconnect from SMTP server. This function should be called when all the SMTP transactions are completed. <"Content"> Text Content. Text content can be as long as you like (see example for creating a multiple-line text). Setup SMTP for sending E-mail. The setting remains in effect until the script ends or another SMTPSETUP is executed. Port is an optional variable. By default, Port is set to 25. This function returns the unique file name. If the file name already exists it auto increment the filename or file extension portion (depending on the "IncrementFileExtension" flag). If the Starting Number is passed, it uses the Starting Number as the starting number for the auto incrementing. To retrieve the content of a variable by its name as a literal string. <Variable Name> is a string representation of the variable name you want to retrieve. Wait for a DOS text to appear at the specified Row and Column for the specified amount of time. The valid Row ranges from 1 to 25. The valid Column ranges from 1 to 80. If the text appears within the time, WAITDOS returns 1, otherwise, it returns 0. This command only works with DOS Application. The example above waits for "Name" to appear at Row 0 and Column 0 for 10 Seconds. If the text does not appear within 10 seconds, report the error. Note: use DOS capturing tool to help you getting the exact row and col from the DOS screen. Wait for a text to appear within the specified window for the specified amount of time (in seconds). If the text appears within the time, WAITWIN returns 1, otherwise, it returns 0. This command only works with windows Application. The example below waits for "Name" to appear at Row 0 and Column 0 for 10 Seconds. If the text does not appear within 10 seconds, report the error. To run a script as a service, the script must first be compiled to an executable using the included ShortRun.exe program. To do this, we are going to assume you have a script called ServiceSample.fbs located in your scripts folder. Creating the script executable and installing the service is all done via the Windows command prompt. 1. Go to File>Run. Enter cmd and press Enter. 3. You are now in the same directory as your script, as well as the ShortRun.exe application. We need to run the ShortRun.exe application and provide it with parameters to compile the script file into an executable that can be run as a service or a standalone application. 5. You will notice that ServiceSample.exe was created inside your \Reform\Scripts directory. Now, you must run the executable through the command prompt and supply it with the /install parameter. 7. A message box will pop up after the script is installed as a service. 4. A message box will pop up after the service is uninstalled. ShortRun.exe –e "<name of script file>" "<name of executable file>"
There are certain directories that must be maintained after you start using Reform. 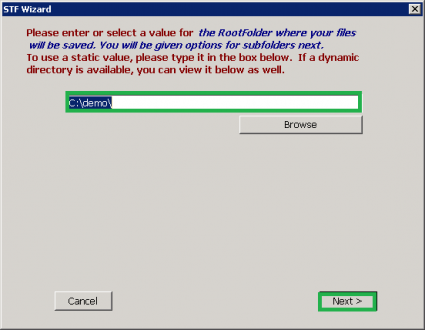 Depending on the options you have configured in the Reform Spooler, the Spooler may create backups of all processed files into the Backups directory. If the Retain Images option is used with the Reform Printer driver, images of processed documents will be stored in the Spooler\ImageQueue directory. As a system processes more and more jobs, the size of these directories can grow very quickly. Overall system performance can be affected by the large amounts of space that the files may take up. Obsolete files should be deleted according to your needs and file retention specifications. If the Spooler is stopping or restarting erratically, close the Spooler application. Bring up your system’s Services panel and find Reform Spooler Service. Refresh the Services list. Right-click the entry for Reform Spooler Service. Hit Stop. Open up the Spooler application [Start > Programs > Reform… > Spooler], and after it loads, click Run. The Reform Spooler Service should start up. If this does not work, try right-clicking the service and hitting Restart, and then re-launching the Spooler Application. Alternatively, for information on what might be causing your Spooler to randomly turn off, you can check in the Event Log. To open the Event Log, open the Control Panel, go to Administrative Tools, open Event Viewer, select Application on the left pane, and look for errors with the source reformEnt. Be sure that the Spooler Service is being run as an administrator. To check this, open up the Services panel on the server computer. Look for Reform Spooler Service. First, refresh the Services panel to make sure that the service is definitely not running. Next, right-click on the Reform Spooler Service item and click Properties. Go to the Logon tab, select This Account, and enter an account that is an administrator on the server machine. It will need to run with full access because it needs to monitor folders and create, write to, rename, and move around files. If you have created a new administrator account, you must log in to the Reform server at least once so that the appropriate permissions can be applied to the new account. If you are setting the service to run under an account that you have not yet logged in under, the service will be unable to start correctly because it has not been configured by Windows yet to have full administrative access to the machine. This is caused by the service account not having sufficient permission to the spooler file. 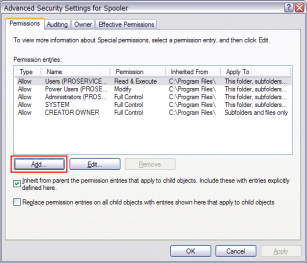 If the detailed log in the Reform Spooler is enabled, it will say that the file is locked because it does not have permission to read from the file. To correct this, you need to repair the security permissions on the Spooler folder. 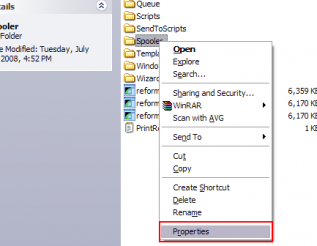 Right-click on the Spooler folder and click Properties. Select the Security tab and click the Advanced button on the bottom of the window. Click the Add button to add a new permission entry. Enter Everyone in the box and click Check Names. Then click OK to create the new permission entry. Select the checkbox for Allow Full Control. It will automatically check the rest of the boxes for you. Click OK. 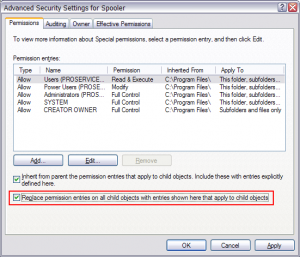 Check the box Replace permission entries on all child objects with entries shown here that apply to child objects. Then click Apply, and click OK. The permissions of the folder should now be set correctly. This is most likely due to incorrect permissions on the directory C:\Windows\System32\spool\PRINTERS\. Follow the steps below to fix the issue. Navigate to C:\Windows\System32\spool\. 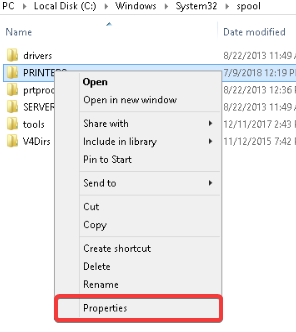 Right click on the PRINTERS folder and click Properties. Click on the Security tab, then select the Users group and click Edit. A new window will open. Click on the Users group and ensure the checkbox is selected next to Read. Click on Apply and then OK.
Open Windows Services (⊞ Win + R, then type services.msc and press OK). 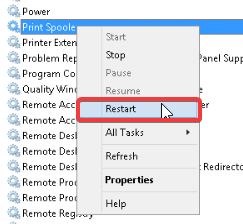 Find and right click on the service named Print Spooler, then click on Restart. After the above steps have been completed, print jobs should no longer get stuck in the Windows printer queue for Reform VDP Printer. This page was last edited on 21 February 2019, at 11:18.